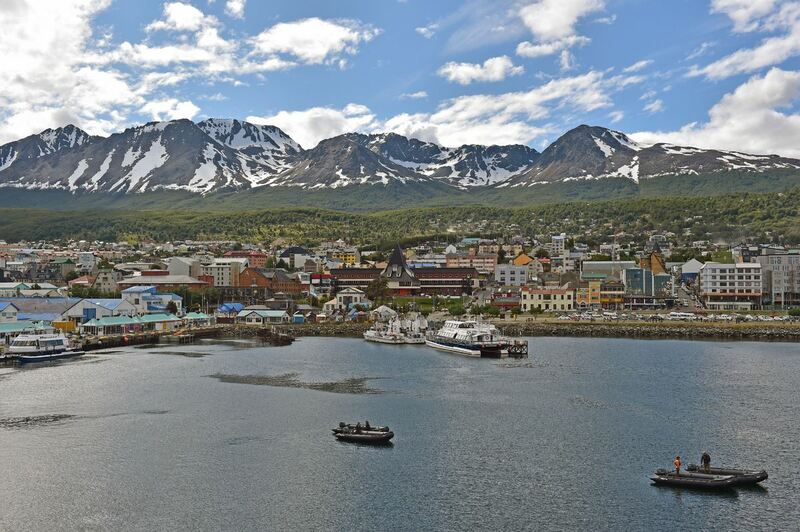 The journey to Antarctica begins at Ushuaia, Del fin mundo - southernmost city in the world. Situated at the southern end of Argentina, it sits at the lap of the Tierra del Fiego region. As you leave Ushuaia, you enter the Beagle channel. 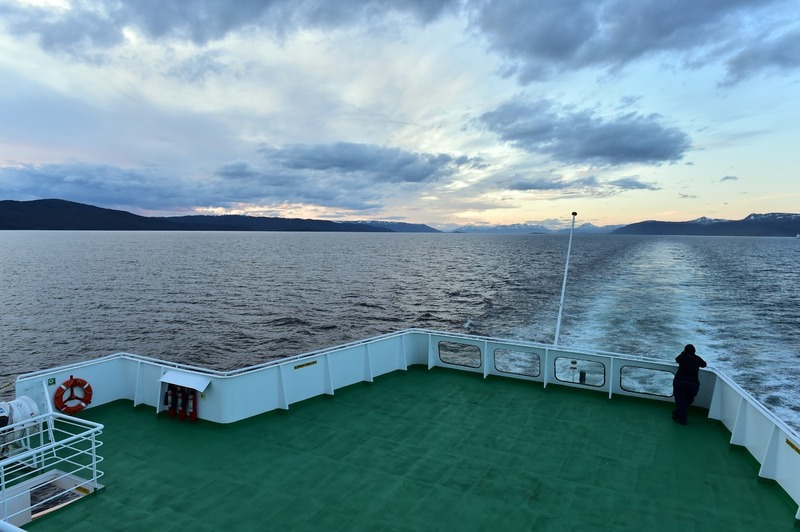 Exiting the Beagle channel, its the onset of Drake Passage, named after Englishman Sir Francis Drake's navigation in 1578. 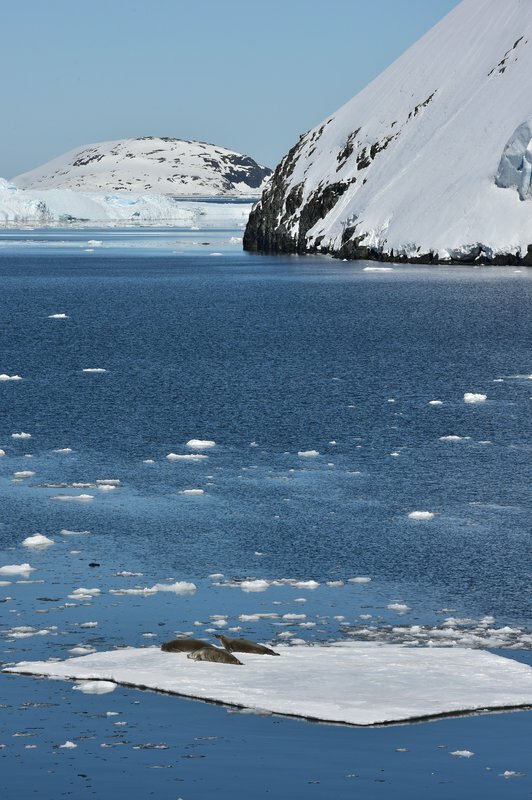 It is the body of water between South America's Cape Horn and the South Shetland Islands of Antarctica. The Drake could be a "shake", i.e. rough and choppy or a "lake", i.e. calm and easy to navigate through. 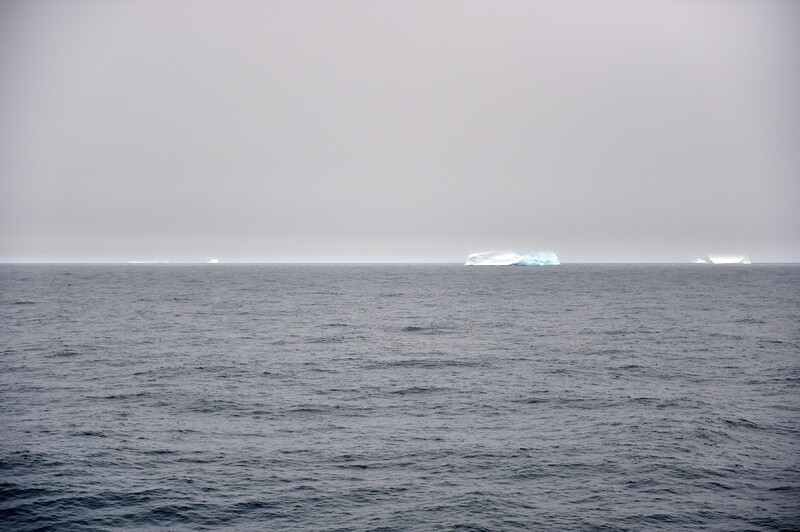 The first tabular bergs and icebergs start to appear providing a glimpse of the landscape that lies ahead. 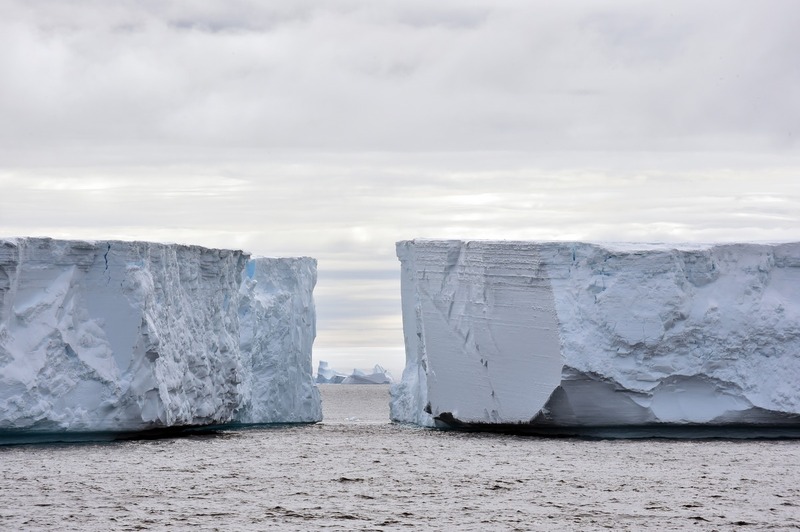 Icebergs and tabular bergs are separated from the glacial faces over the years due to calving and climate change. 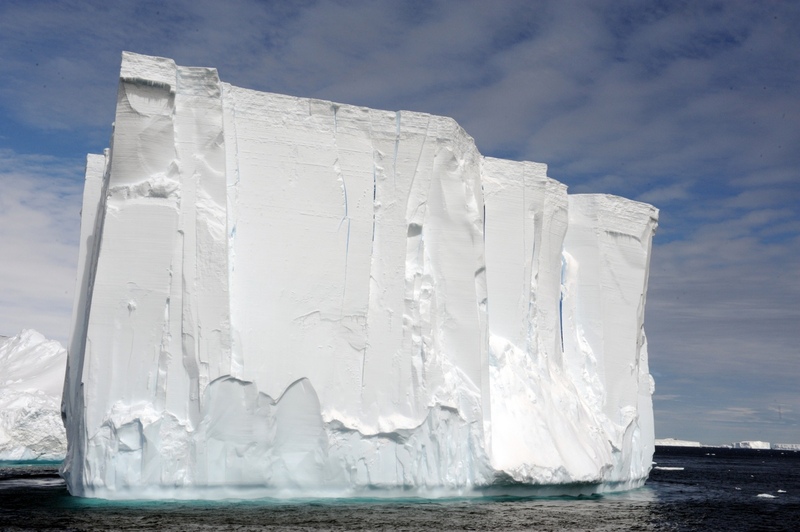 Icebergs that have been formed from older glaciers have little internal air or reflective surfaces. When long wavelength light (i.e. 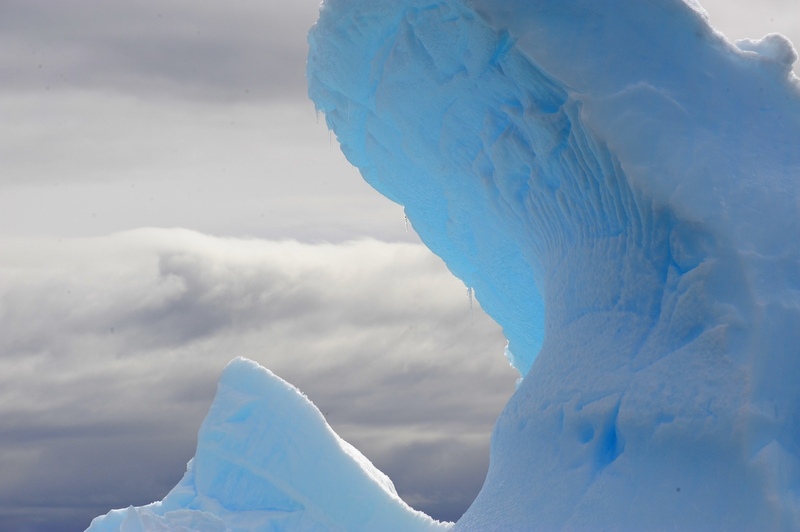 red) from the sun hits the iceberg, it is absorbed, rather than reflected. 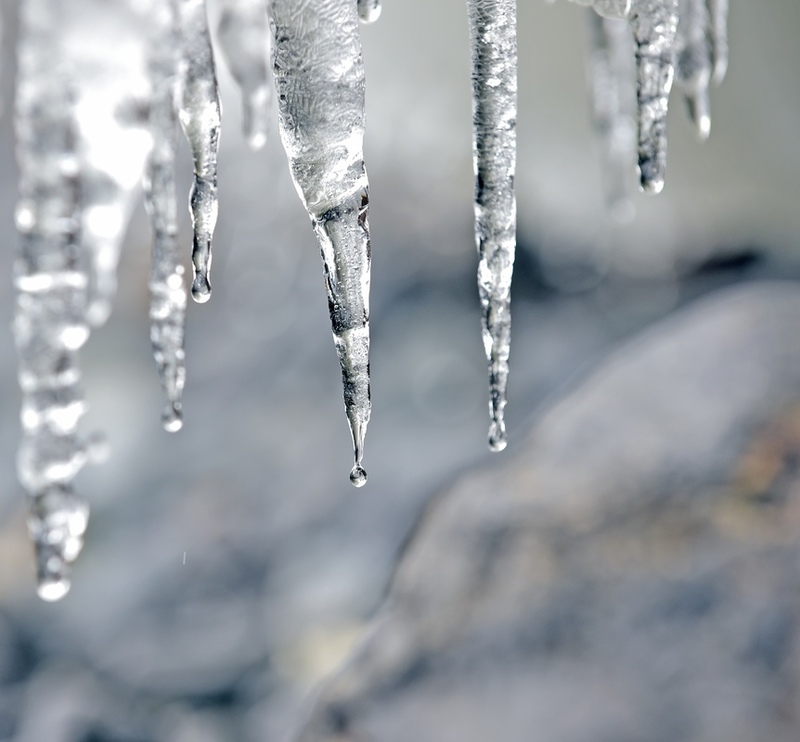 The light transmitted or refracted through the ice returns as blue or blue-green. 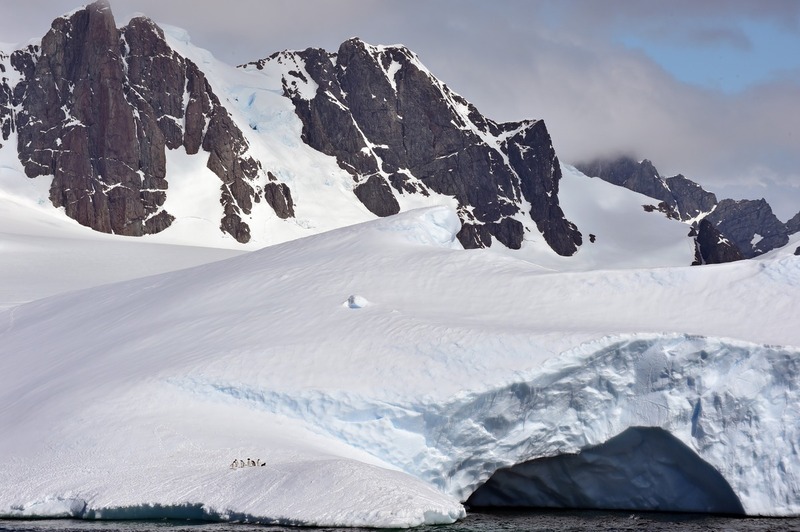 Antarctica is the coldest, driest, windiest and highest landmass on earth. 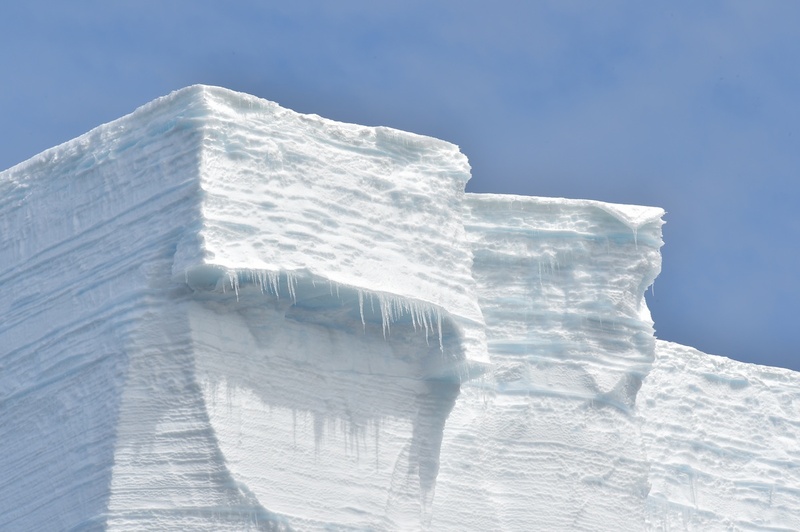 It was here, at the Russian Vostok station, that the lowest temperature on Earth was recorded: -89.2 °C in 1983. 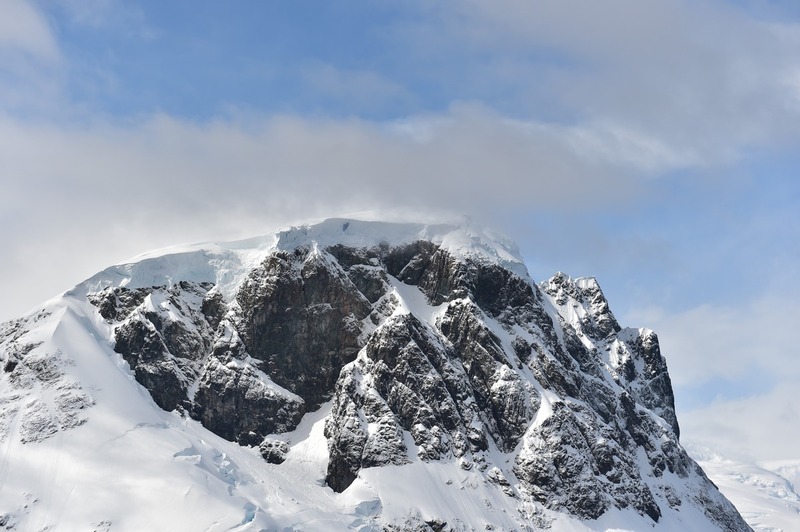 Antarctica isn't just the coldest place on Earth, it is also one of the windiest. A wind speed of 320 km/h (200 mph) was recorded at the French Dumont d'Urville base in July 1972. 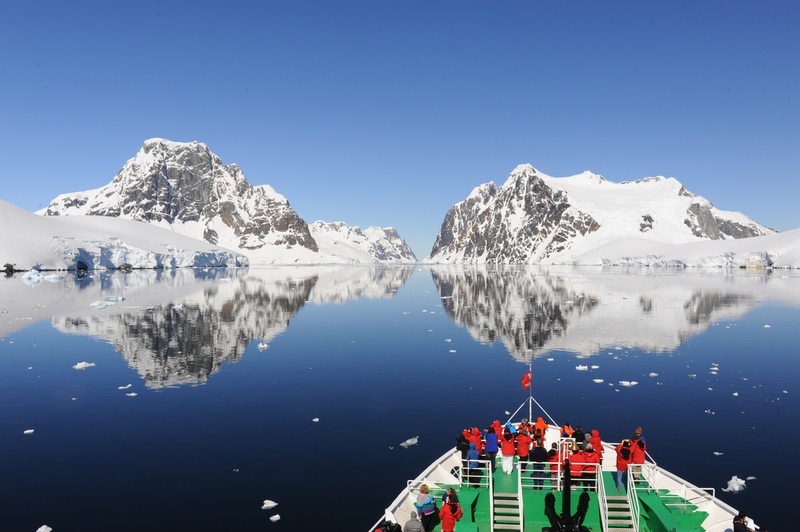 Exploration of Antarctic peninsula dates back to early 18th century when the likes of British Cpt. 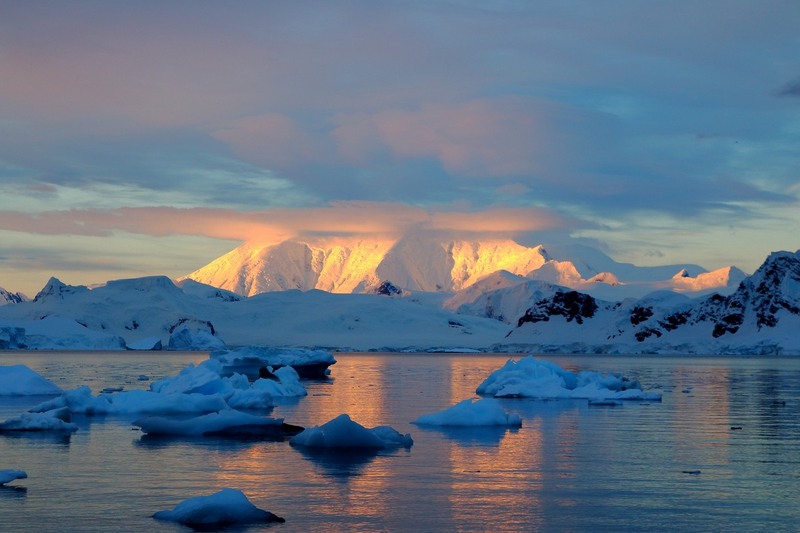 James Cook, albeit unbeknownst, circumnavigated the Antarctic continent. 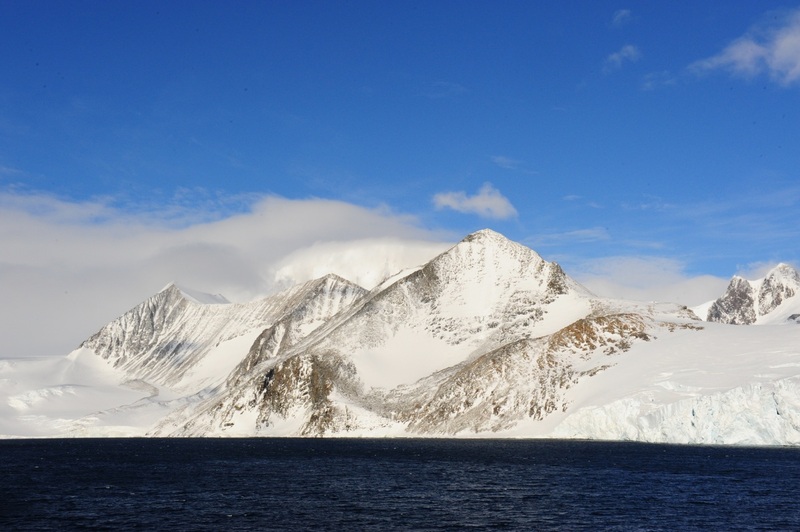 This was later formally discovered by William Smith who anchored on South Shetland Islands. 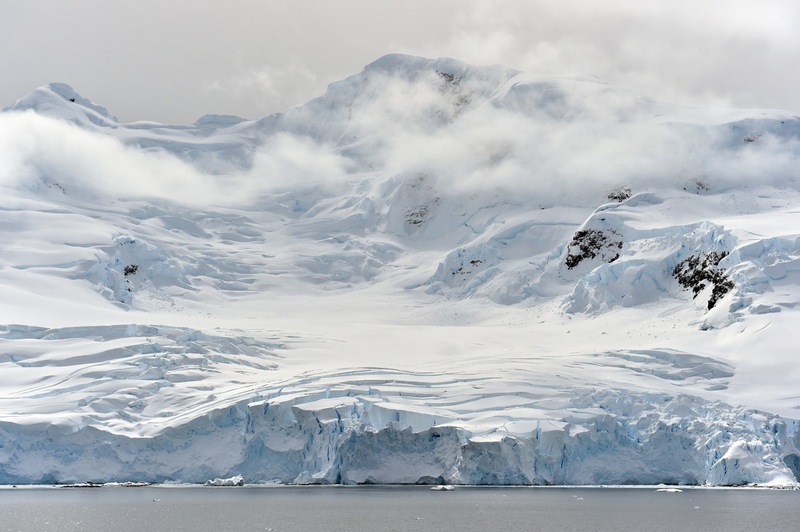 It was only in 1821 that American sailor, John Davis was the first person to set foot on the Antarctic continent. 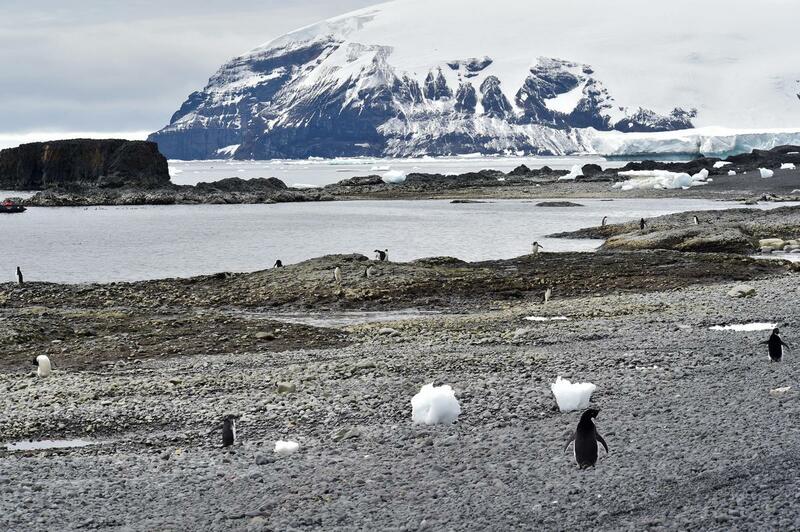 Today there are several stations in Antarctica that are performing various kinds of research, shown above is Port Lockroy. The harbour was used for whaling between 1911 and 1931. 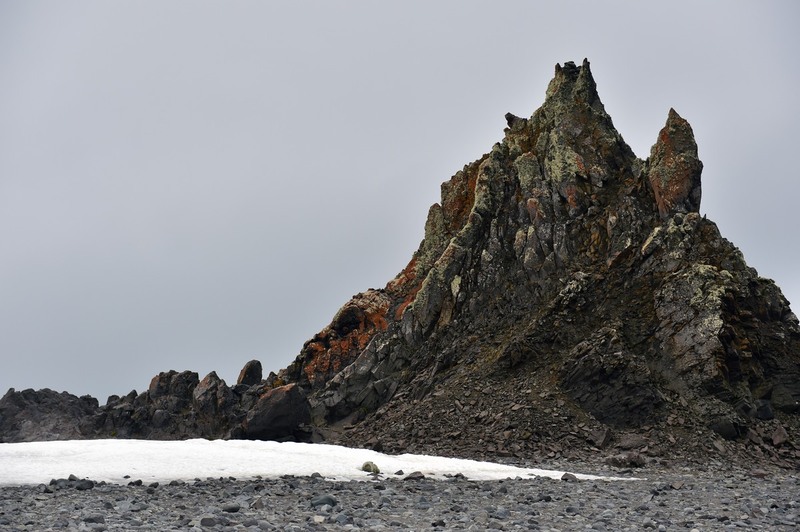 During World War II the British military Operation Tabarin established the Port Lockroy base (Station A) on tiny Goudier Island in the bay, which continued to operate as a British research station until 1962. 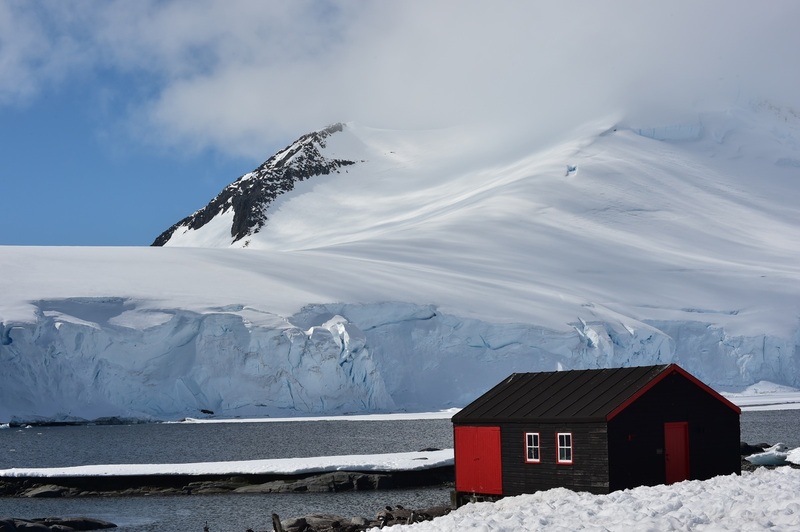 In 1996 the Port Lockroy base was renovated and is now a museum and post office operated by the United Kingdom Antarctic Heritage Trust. 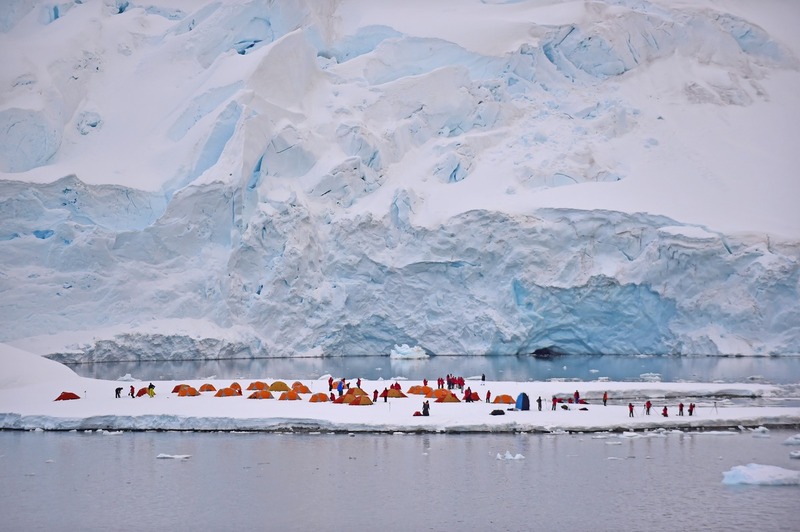 The spirit of adventure beckons tourists to the southern most places in the world, camping and reliving the moments of the early explorers. The most risky and death defying expeditions were that of Norwegian explorer Roald Amundsen who was the first to reach the south pole in 1911, followed by English navyman Robert Falcon Scott who got there just a month after Amundsen - an agonising month late of losing that record - which also resulted in the death of all of Scott and his crew in 1912. The 1910s were the peak of exploration. Ernest Shackleton led several expeditions back and forth, but the most challenging was that of 1914, when their ship Endurance was trapped in pack ice and finally sank, fortunately later to be rescued by Chilean vessels. 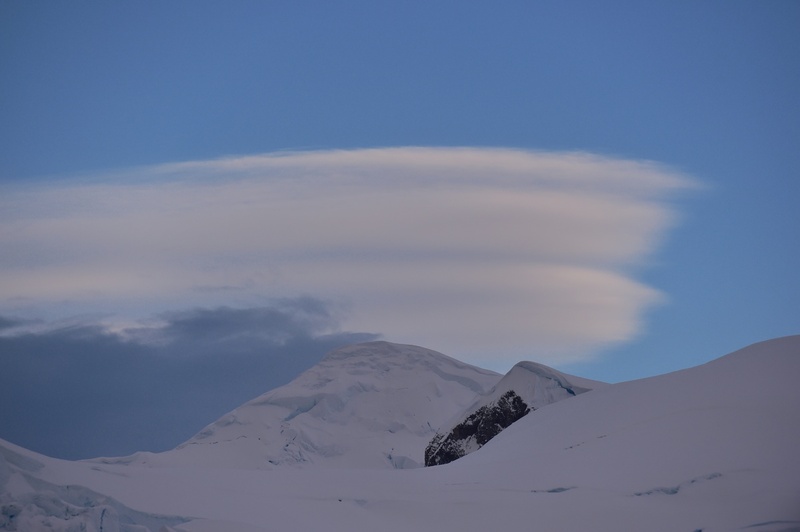 Lenticular clouds provide a good backdrop the mountain line. 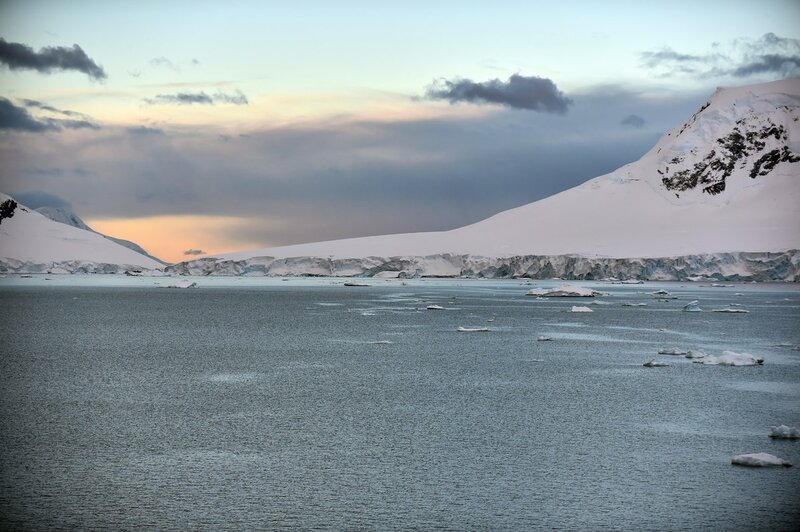 Shown above is Lemaire Channel - a strait off Antarctica, between Kiev Peninsula in the mainland's Graham Land and Booth Island. 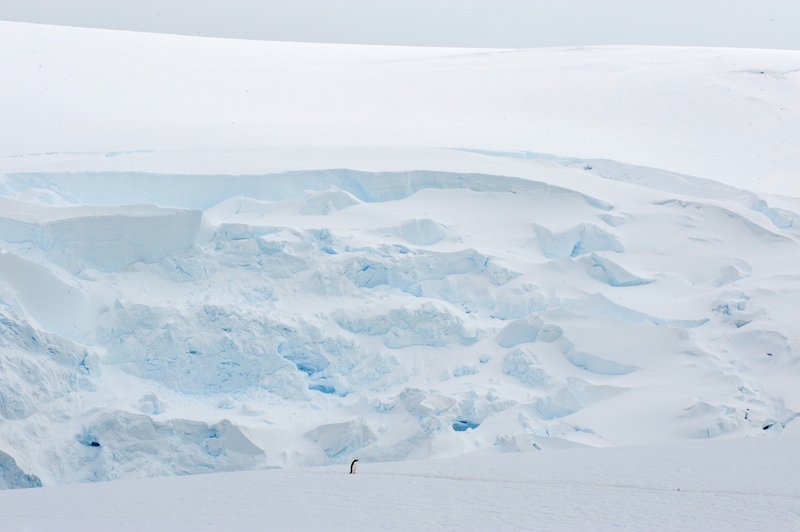 It is 11 km long and just 1,600 metres wide at its narrowest point. 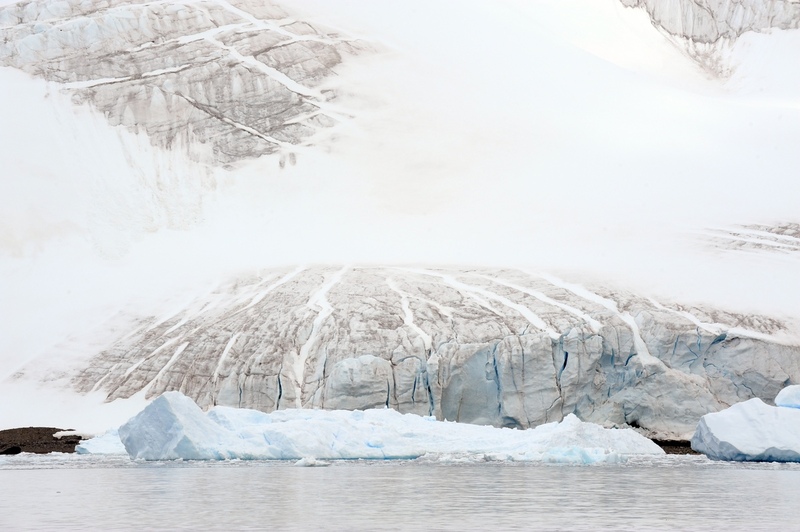 It was first seen by the German expedition of 1873-74, but not traversed until December 1898, when the Belgica of the Belgian Antarctic Expedition passed through. Expedition leader Adrien de Gerlache named it for Charles Lemaire (1863-1925), a Belgian explorer of the Congo. 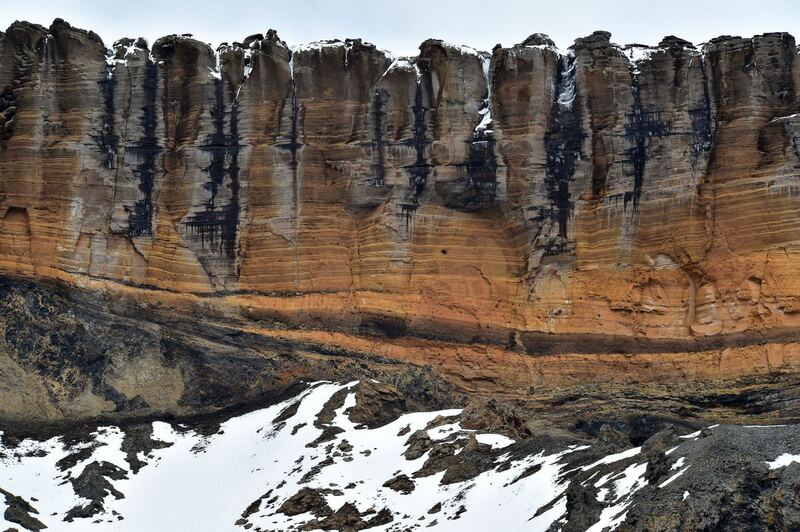 Antarctica is a geologists paradise. 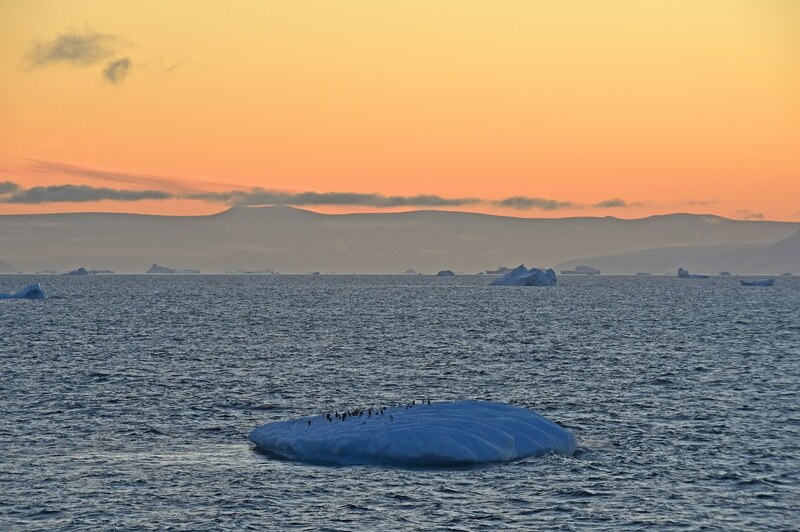 The geological history of Antarctica covers the geological development of the continent through the Proterozoic Eon, Paleozoic, Mesozoic and Cenozoic eras. 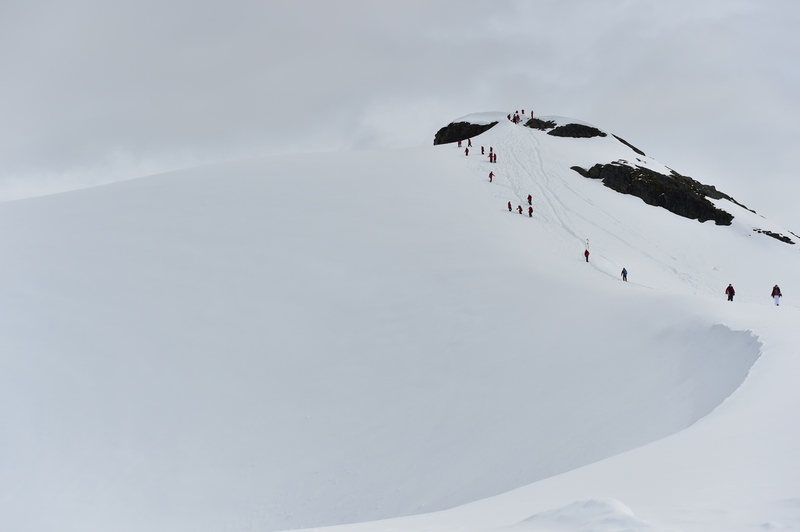 There is life and movement in every inch of Antarctica, albeit at a different scale to what we are used to in urban habitats. The only vegetation is lichen and moss communities that drape the wild landscapes. In water, the life bearing sites are at the cusp of water and ice where green algae grows. Here, one can find, phytoplankton that are photosynthesizing microscopic organisms inhabiting the upper sunlit layer of almost all oceans and bodies of fresh water. They are agents for "primary production," the creation of organic compounds from carbon dioxide dissolved in the water, a process that sustains the aquatic food web. The primary consumers of algae and plankton at the base of this foods chain are small fishes and krill, as shown above. 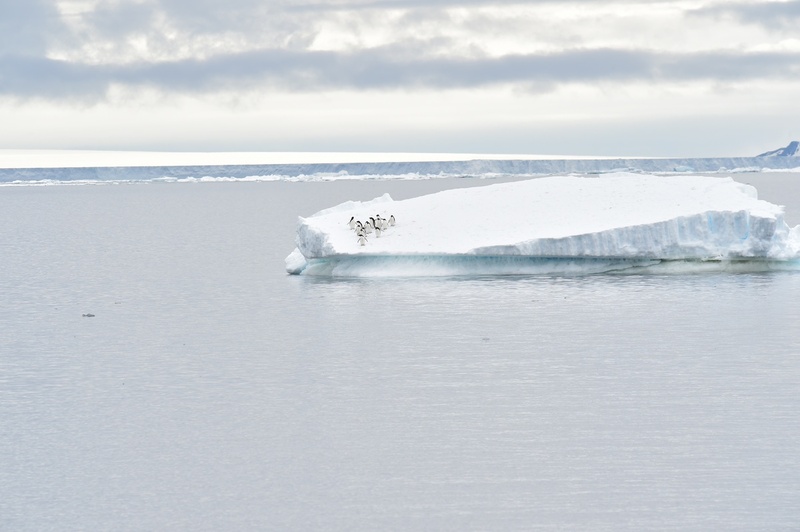 These are very important for the sustenance of all fauna found in Antarctica. 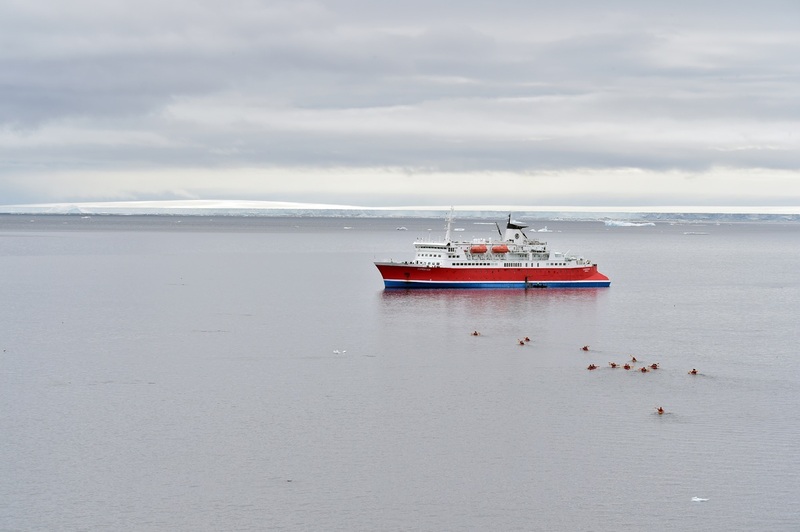 The birds look out for fish and krill to feed on. 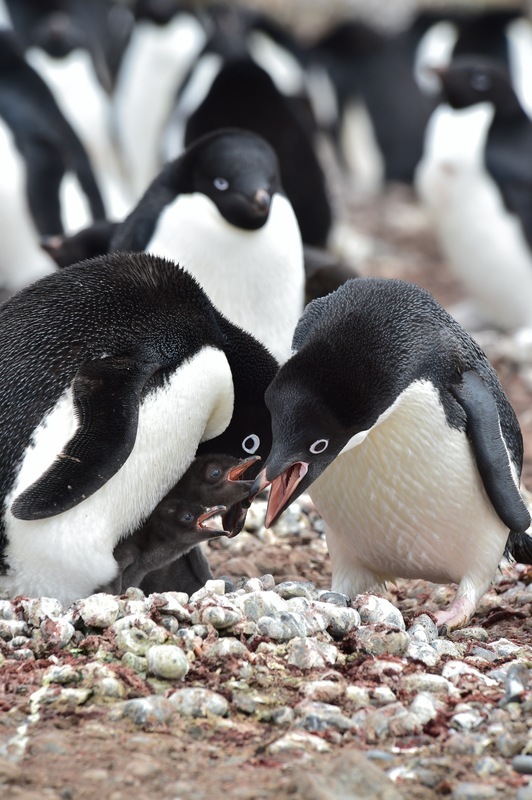 They also prey on eggs of penguins and other smaller birds. 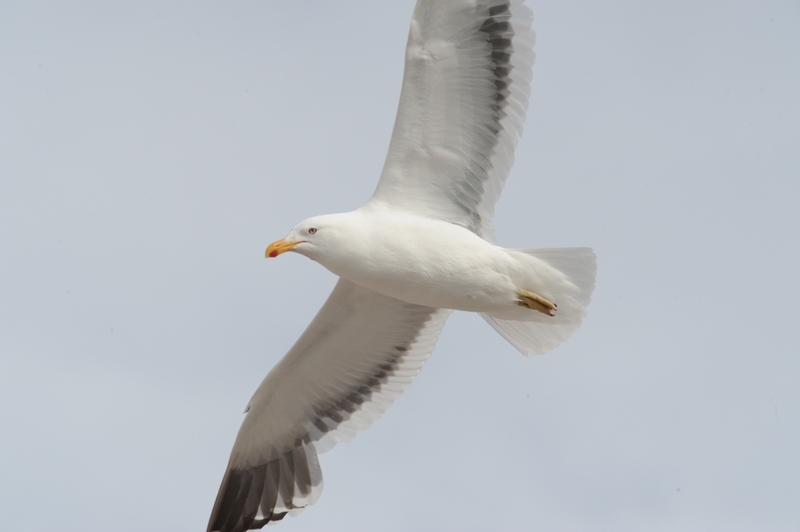 Shown above is a Kelp Gull in surveillance flight. 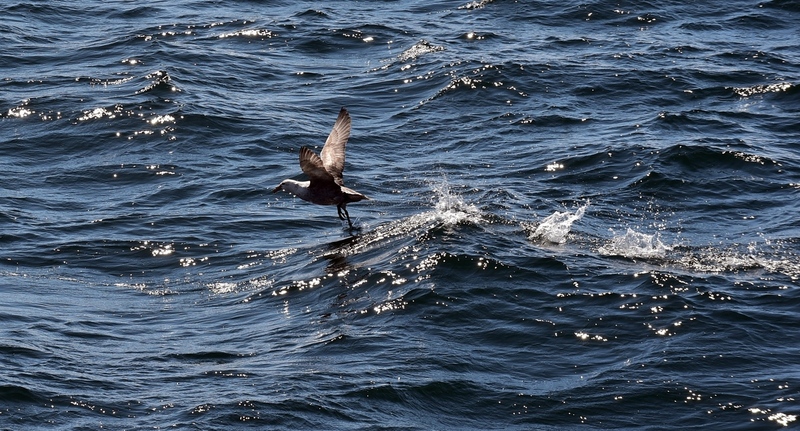 The kelp gull superficially resembles two gulls from further north in the Atlantic Ocean, the lesser black-backed gull and the great black-backed gull and is intermediate in size between these two species. This species ranges from 54 to 65 cm (21 to 26 in) in total length, from 128 to 142 cm (50 to 56 in) in wingspan and from 540 to 1,390 g (1.19 to 3.06 lb) in weight. 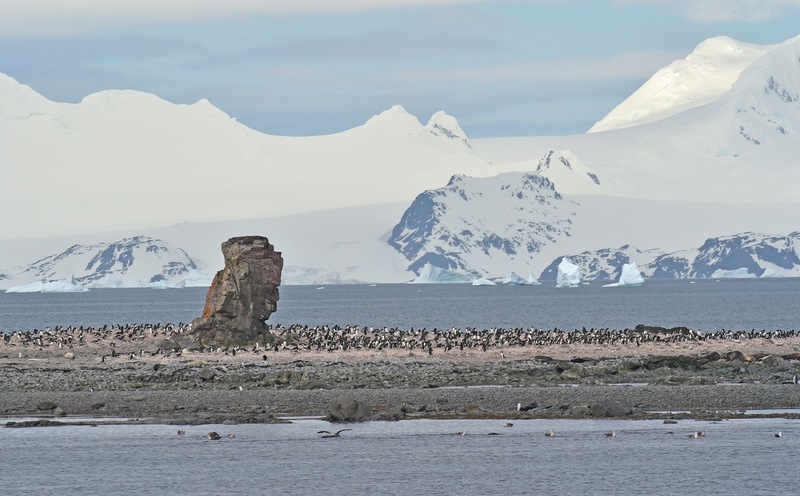 Colloquially known as the chickens of Antarctica, primarily due to the abundance, sheath bills breed on subantarctic islands and the Antarctic Peninsula. 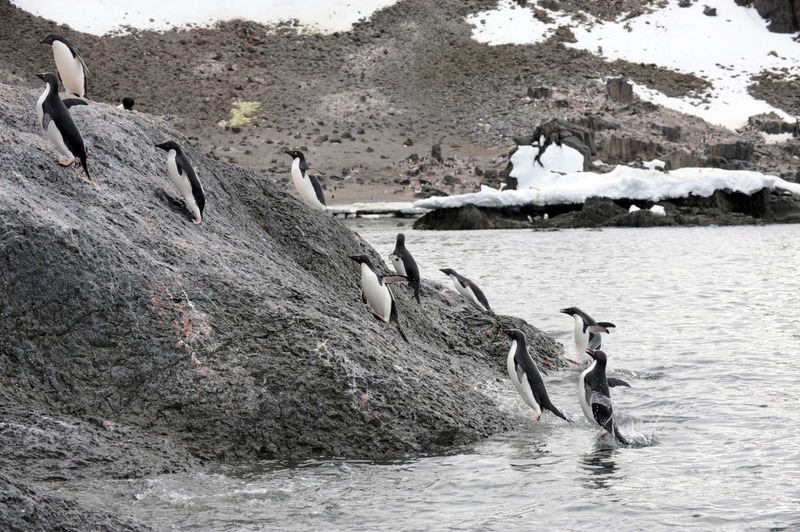 They are also the only Antarctic birds without webbed feet. 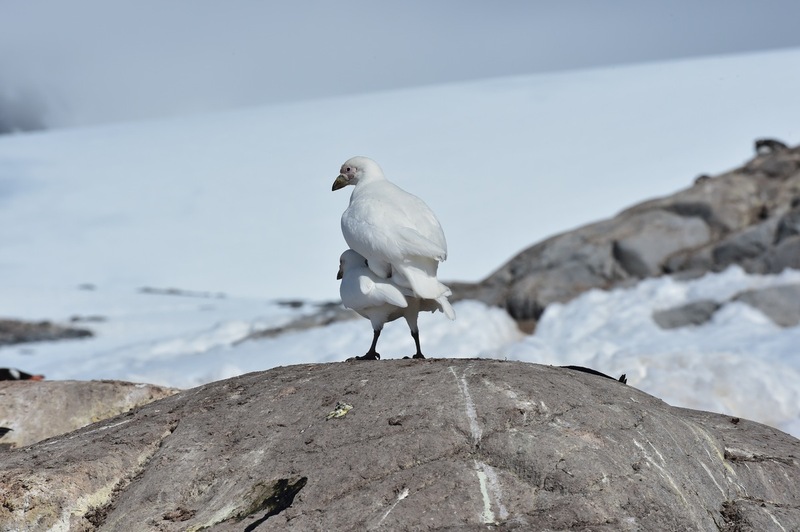 The snowy sheathbill migrates to the Falkland Islands and coastal southern South America in the southern winter; they are the only bird family endemic as breeders to the Antarctic region. 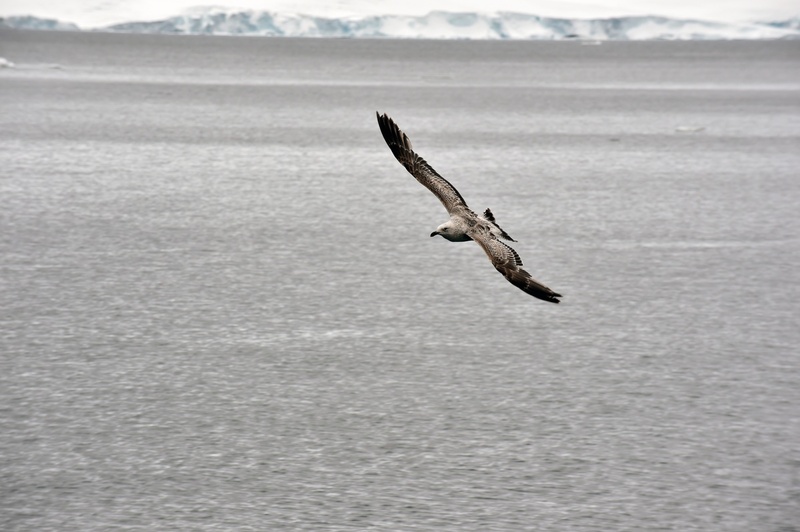 The south polar skua is a large seabird in the skua family Stercorariidae. 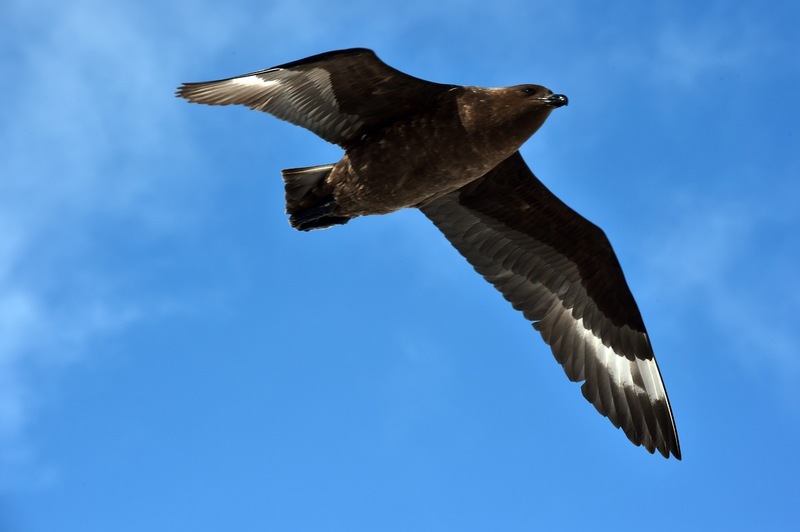 An older name for the bird is MacCormick's skua, after explorer and naval surgeon Robert McCormick, who first collected the type specimen. 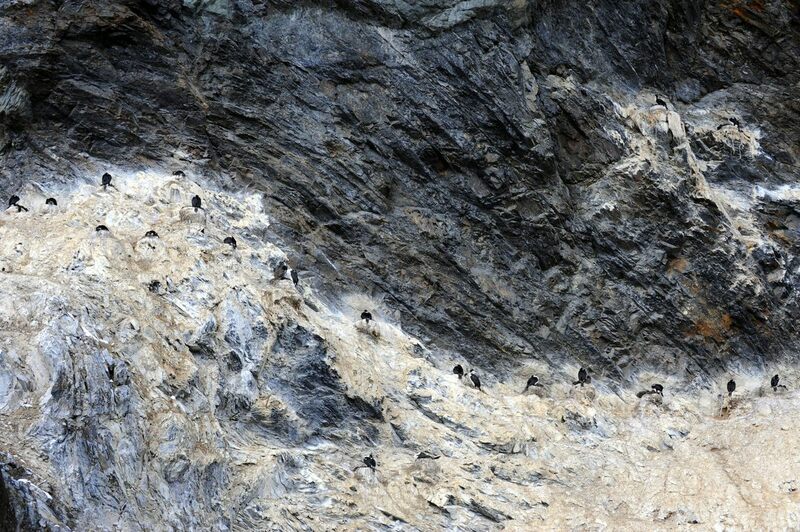 Skua's shown above engage in feisty dialogue over territory. The south polar skua eats mainly fish, often obtained by robbing gulls, terns and even gannets of their catches. It will also eat other birds, rabbits, and carrion. 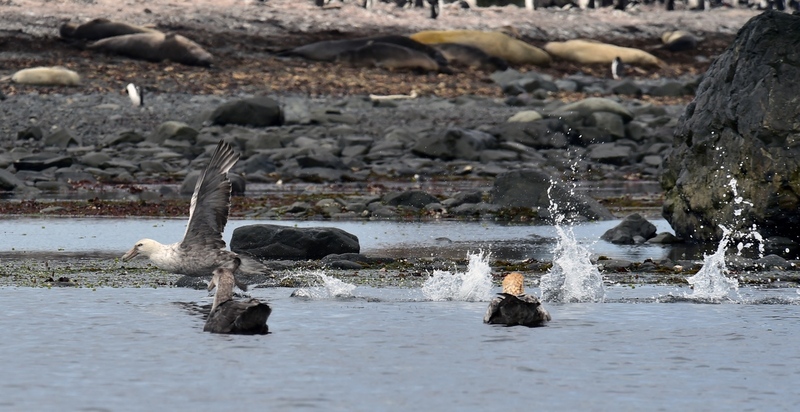 Like most other skua species, it continues this piratical behaviour throughout the year, showing less agility and more brute force than the smaller skuas (jaegers) when it harasses its victims. 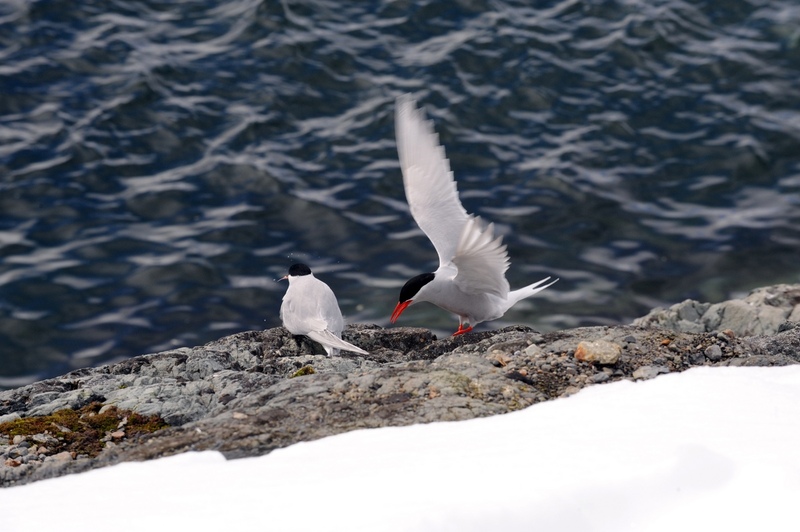 The Antarctic tern (Sterna vittata) is a typical tern. It ranges throughout the southern oceans. It is very similar in appearance to the closely related Arctic tern, but is stockier, and the wing tips are grey instead of blackish in flight. It is, of course, in breeding plumage in the southern summer, when the Arctic tern has moulted to its non-breeding plumage. Breeding takes place from mid-November to early December. Chicks hatch from December to February. 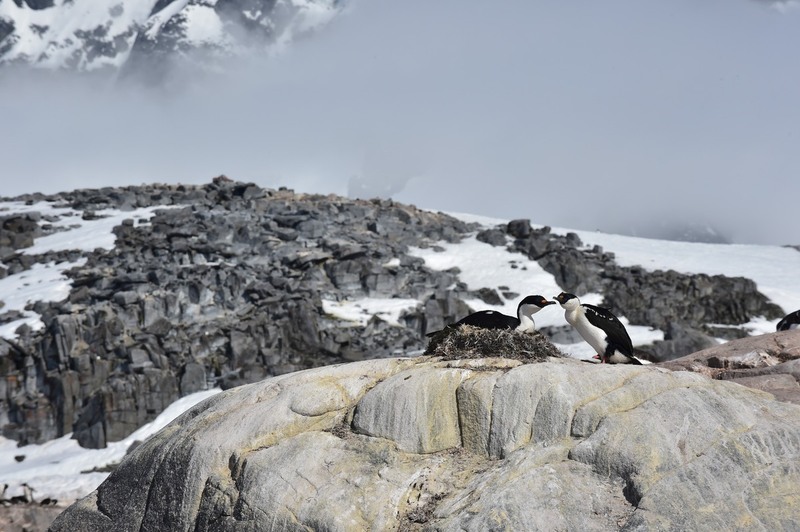 Skuas and jaegers are the primary predators of this bird's eggs and young. 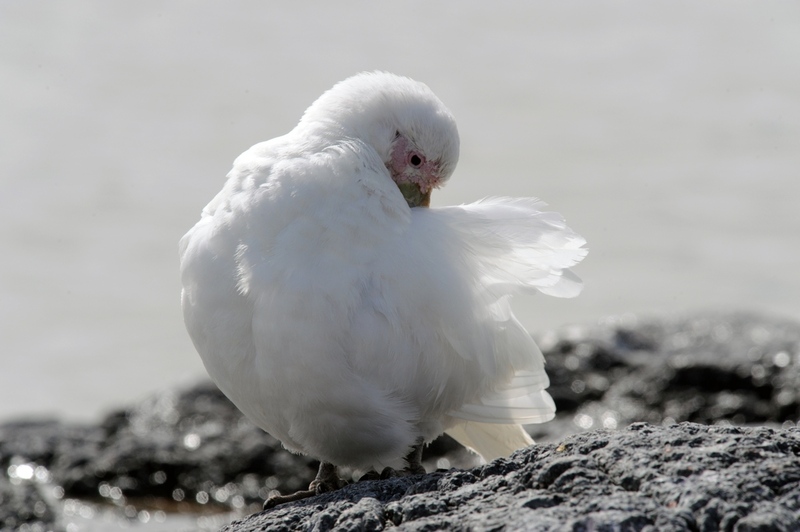 The total global population of this bird is around 140,000 individuals. I have not been privy to photographing the albatross, but the giant petrels shown above are an abundance of joy to watch and photograph. They are the Boeing 747s of the bird species - large bodies and elegantly taking off with drama at the surface of water with every flap of the wing. Everywhere they take off, they provide excellent freeze frames. And equally elegant when in flight, sweeping low to find food. 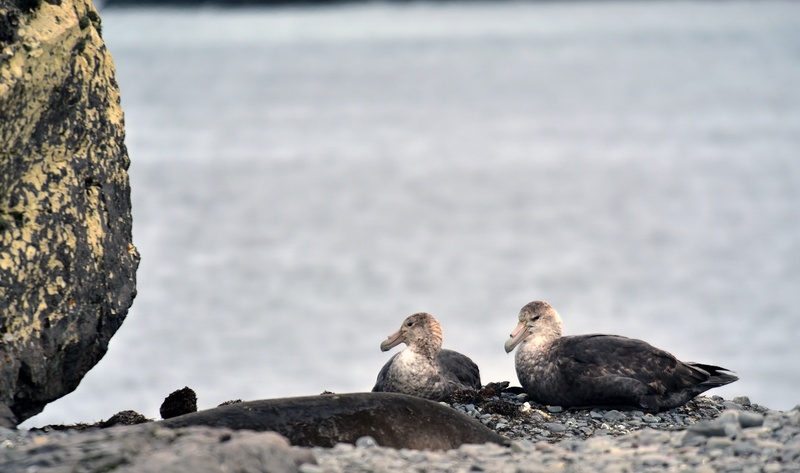 The southern giant petrel is slightly larger than the northern giant petrel, at 3 to 8 kg (6.6-17.6 lb), 180 to 210 cm (71-83 in) across the wings and 86 to 100 cm (34-39 in). 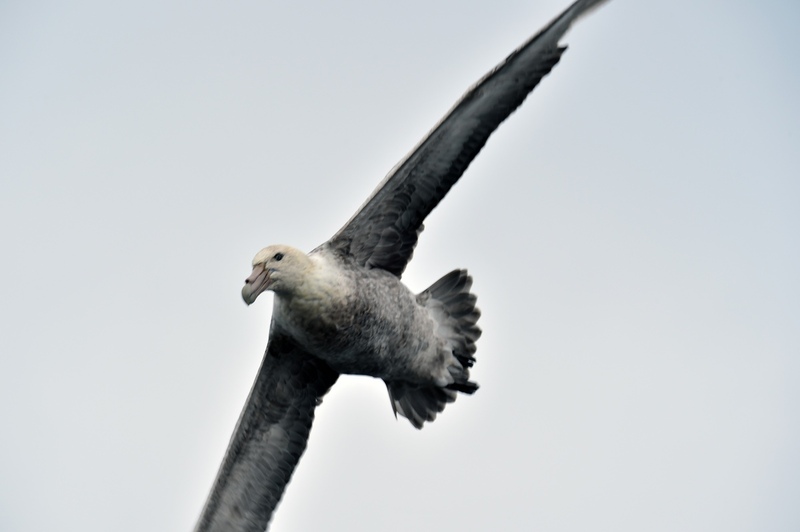 The northern giant petrel is 3 to 5 kg (6.6-11.0 lb), 150 to 210 cm (59-83 in) across the wings and 80 to 95 cm (31-37 in). They superficially resemble the albatross, and are the only procellarids who can equal them in size. 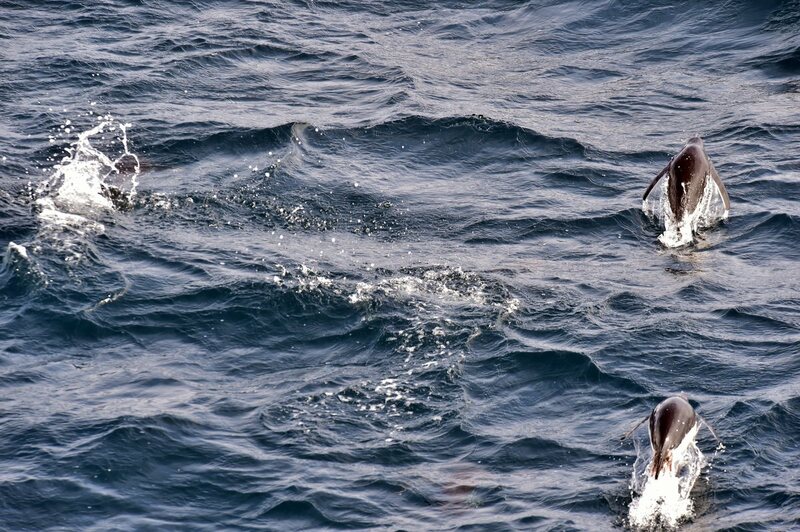 They can be separated from the albatrosses by their bill; the two tube nostrils are joined together on the top of the bill, unlike on albatross where they are separated and on the side of the bill. They are also the only members of the Procellariidae family to have strong legs to walk on land. 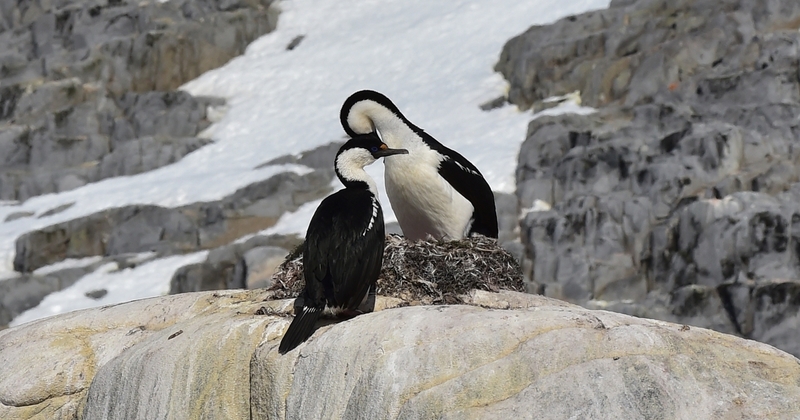 The blue-eyed shags are a group of closely related cormorant taxa. All have a blue, purple or red ring around the eye (not a blue iris); other shared features are white underparts (at least in some individuals) and pink feet. They are found around the colder parts of the Southern Hemisphere, especially near southern South America, Antarctica, and New Zealand. Many are endemic to remote islands. 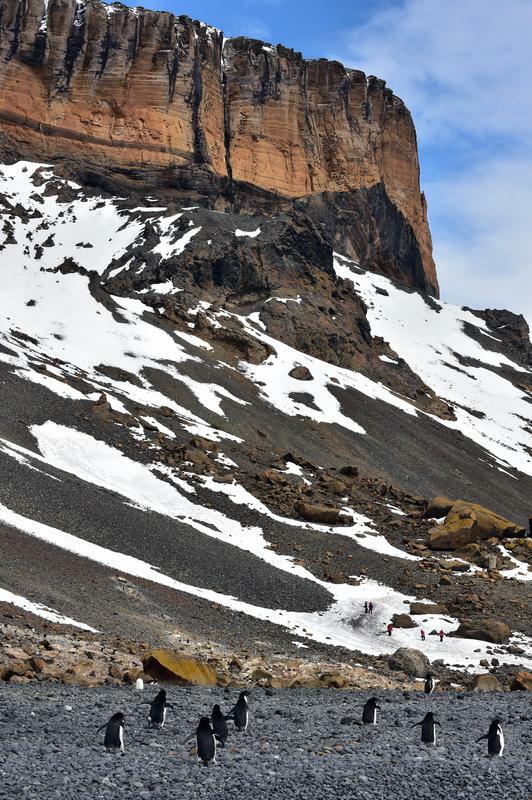 Steep cliff faces offer challenging breeding grounds. The hatching of eggs and caring for the chicks is so imminent that such vertical drops are not a cause of concern. 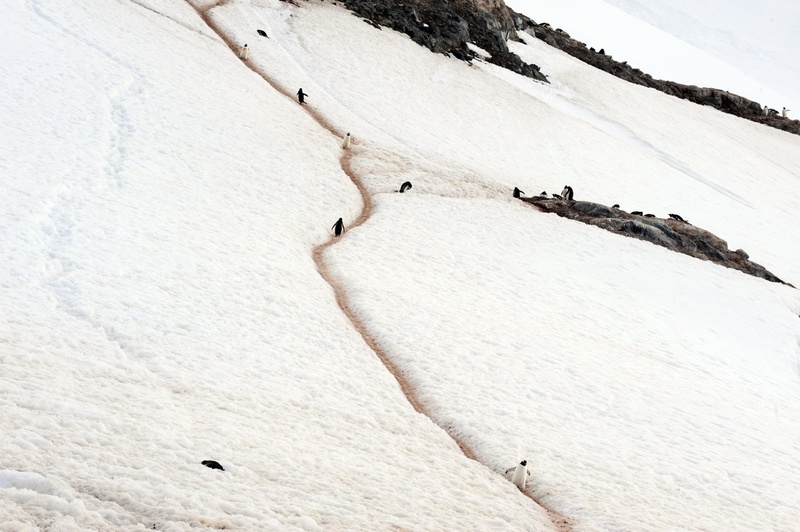 Elsewhere, they are on gentler slopes like above. 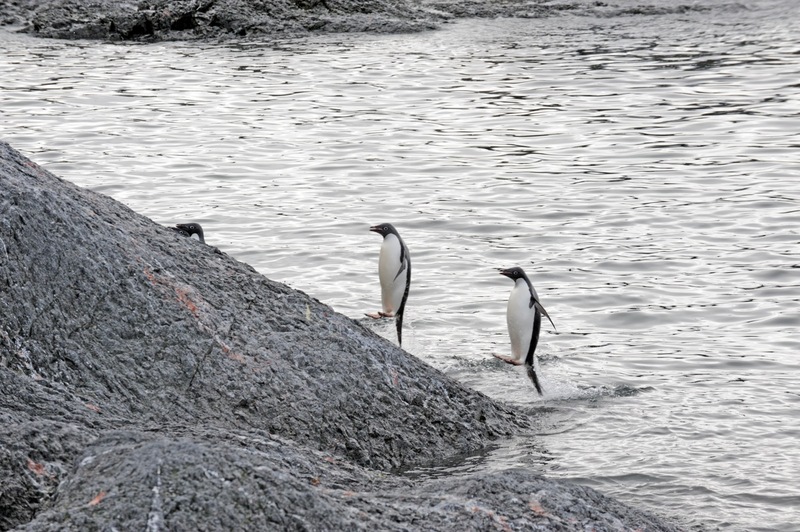 And at the foothills are co-existing neighbours - the penguins. 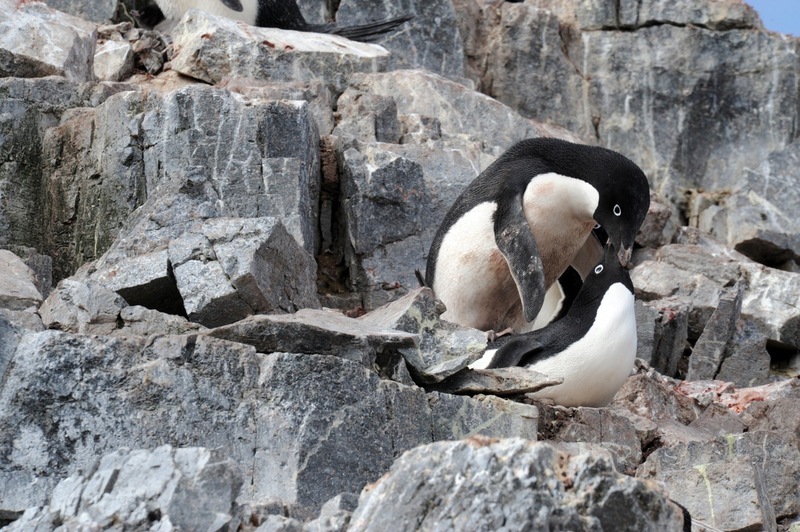 Shown here are the adelie penguins. They can live in harshest of isolation on land. 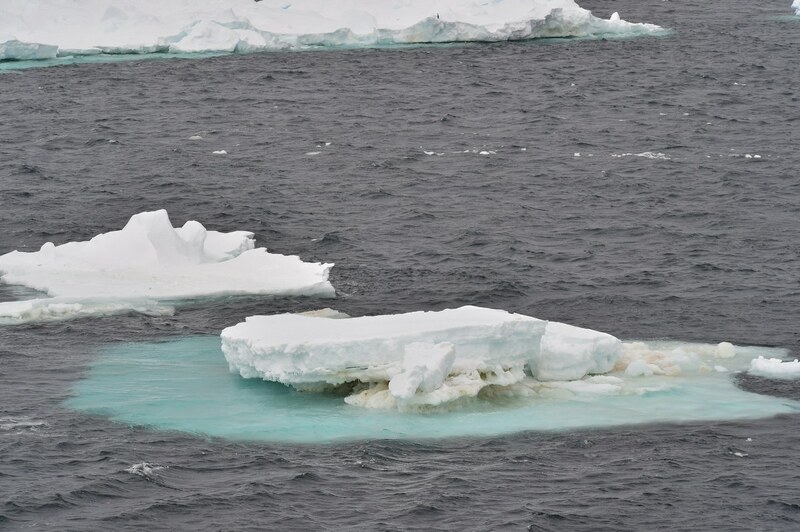 Or on floating pack ice dwarfed by tabular bergs shown above. They can live in small colonies to define safety in numbers. Or closer to shore to find places for breeding and hatching. Penguins are a group of aquatic, flightless birds living almost exclusively in the Southern Hemisphere, especially in Antarctica. 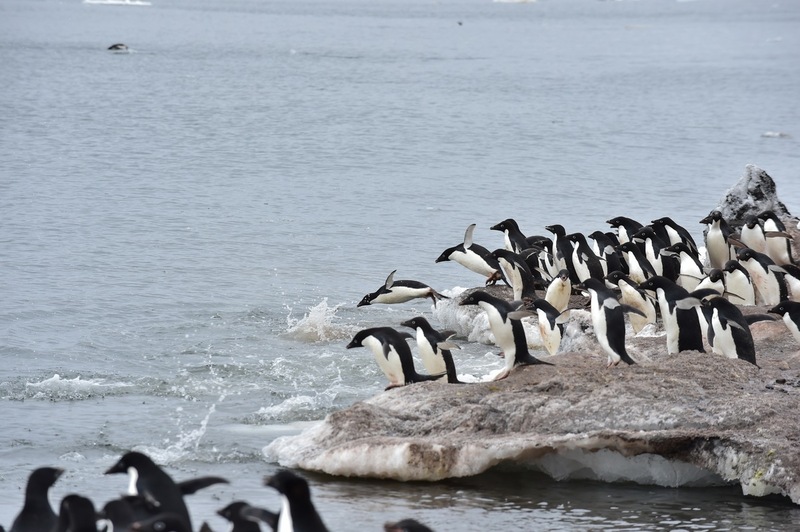 Highly adapted for life in the water, penguins have countershaded dark and white plumage, and their wings have evolved into flippers. 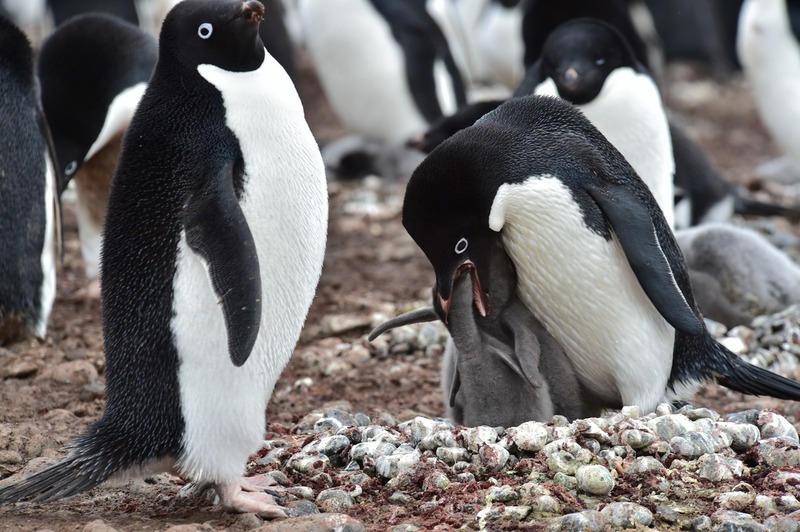 Most penguins feed on krill, fish, squid and other forms of sealife caught while swimming underwater. They spend about half of their lives on land and half in the oceans. The largest living species is the emperor penguin (Aptenodytes forsteri): on average adults are about 1.1 m (3 ft 7 in) tall and weigh 35 kg (77 lb) or more. The smallest penguin species is the little blue penguin (Eudyptula minor), also known as the fairy penguin, which stands around 40 cm (16 in) tall and weighs 1 kg (2.2 lb). 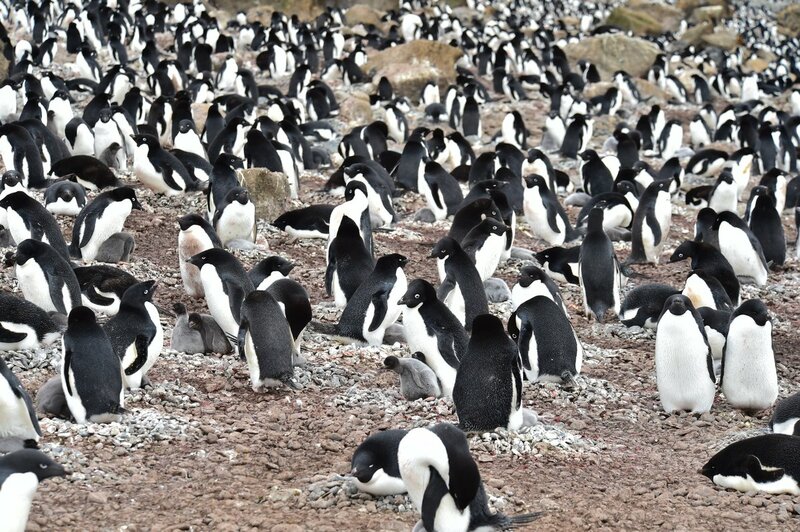 Here, we see a colony of Adelie penguins. 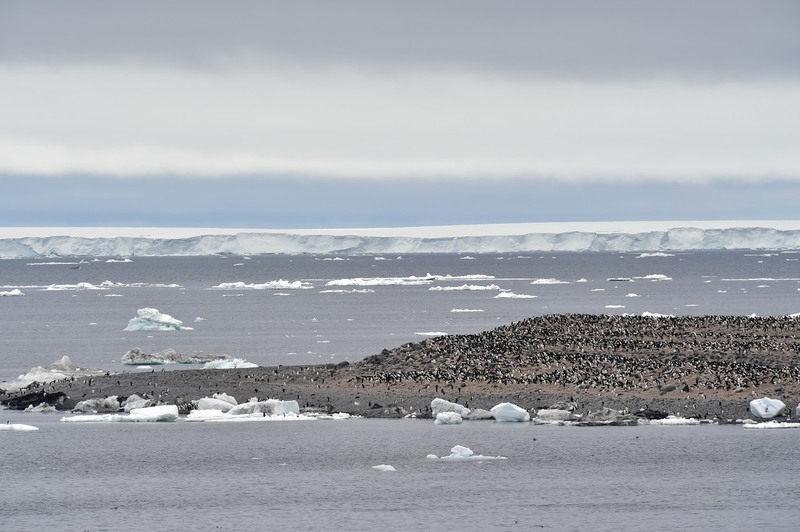 They are among the most southerly distributed of all seabirds, along with the emperor penguin, the south polar skua, the Wilson's storm petrel, the snow petrel, and the Antarctic petrel. 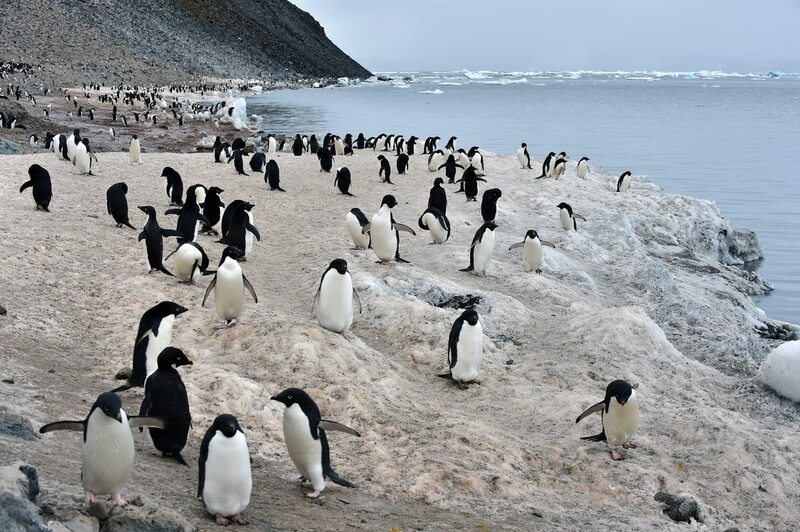 They are named after Adélie Land, in turn named for the wife of French explorer Jules Dumont d'Urville who discovered these penguins in 1840. 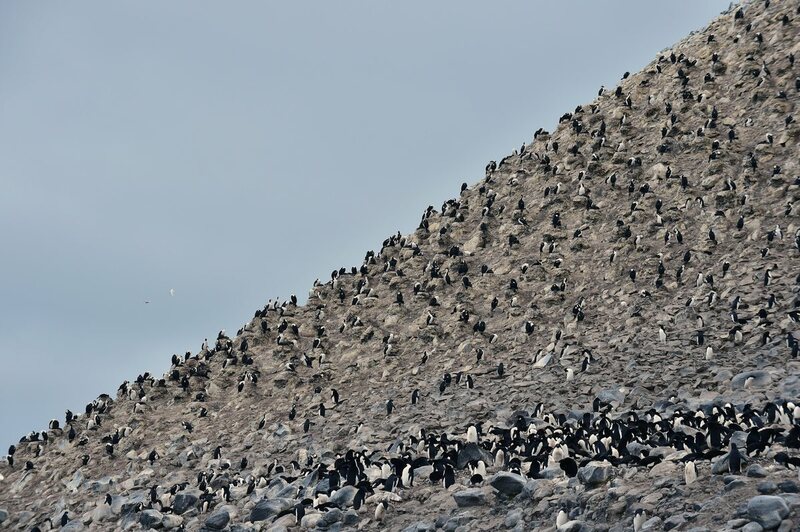 As large as hundreds of thousands as one can see in Paulet Island, Antarctica. 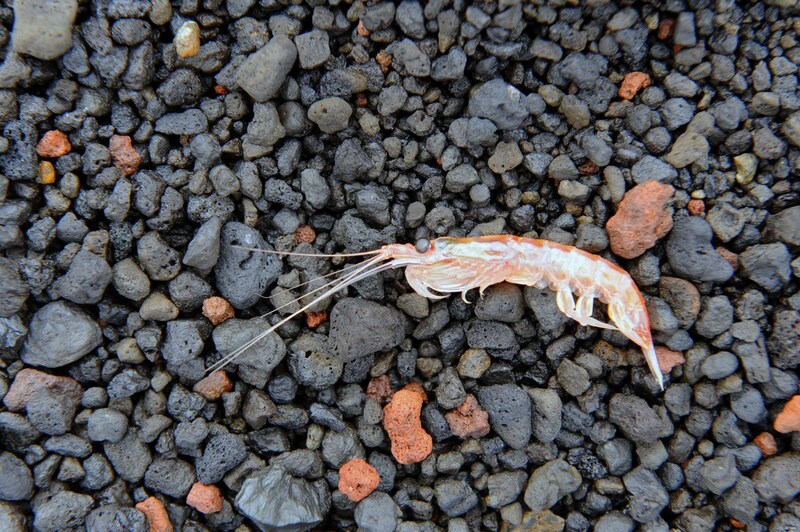 They also feed on water from ice washed ashore. As all living organisms do, they mate - male on top of female. 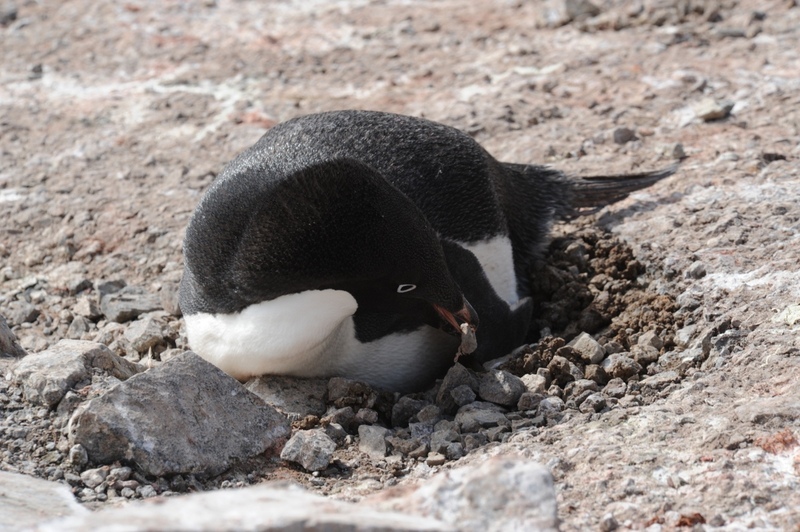 Once pregnant, the female meticulously builds a nest of small stones and pebbles to isolate from the moist and damp ground. Large open air maternity ward. 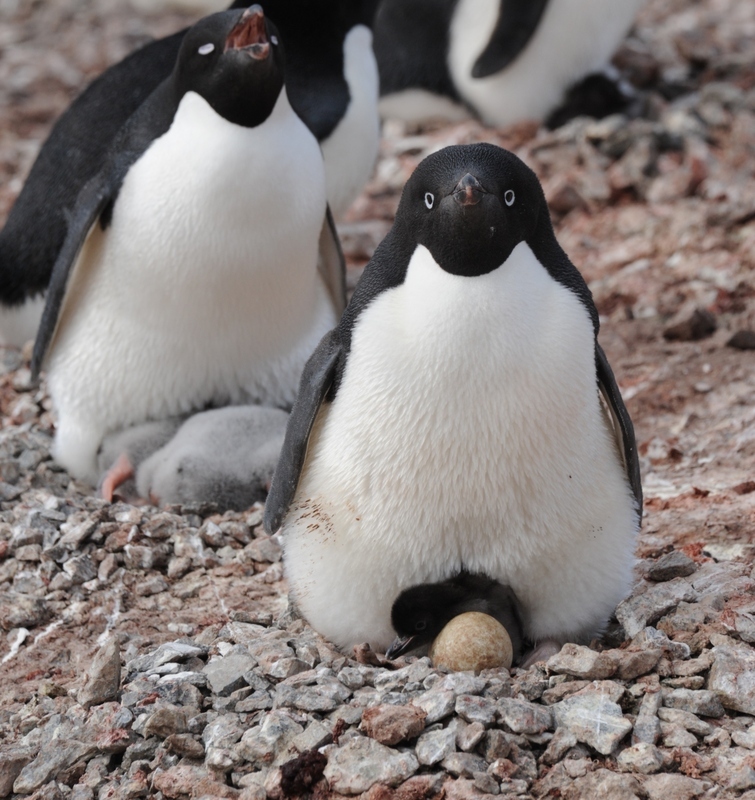 The mother takes care of the egg and the offspring. 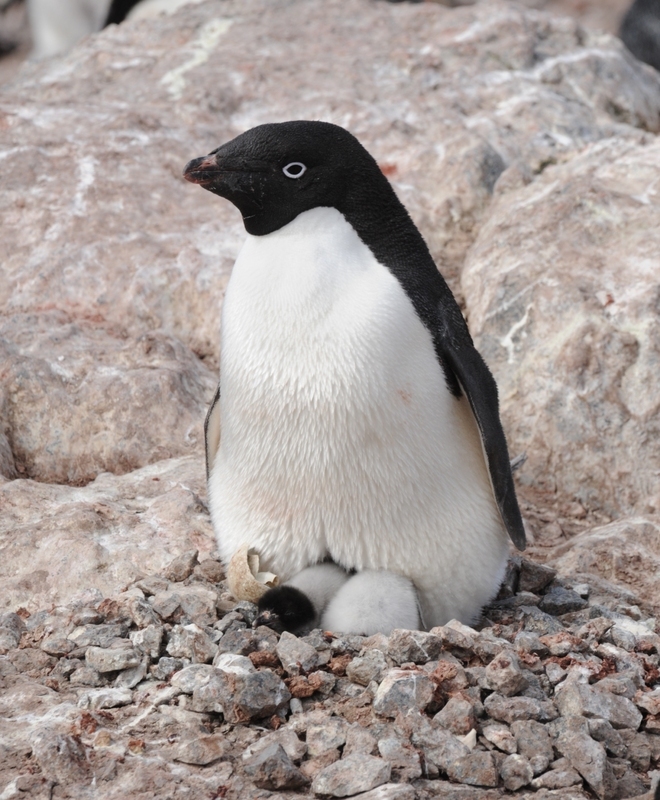 Just born - notice the cracked egg at the left side of the feet. They grow up and demand food. 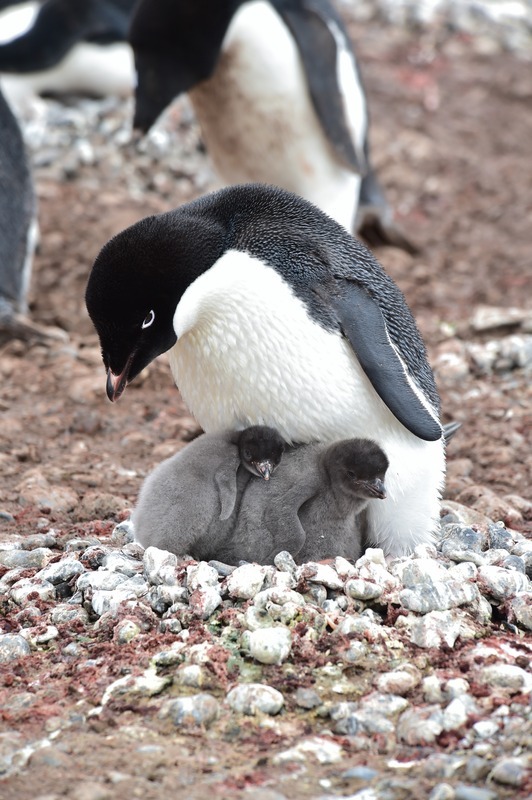 The father goes up and down the hill and breeding grounds between mother and sea on well structured and designated penguin "highways." 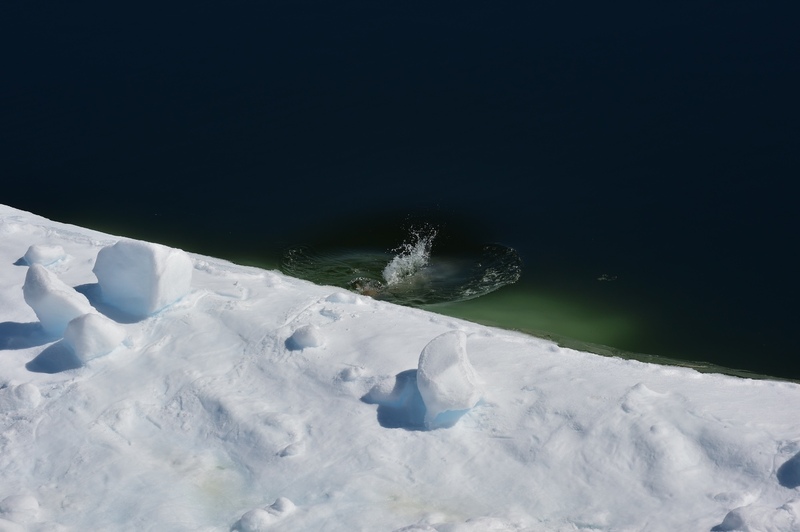 At the end of the ice, they jump into water. 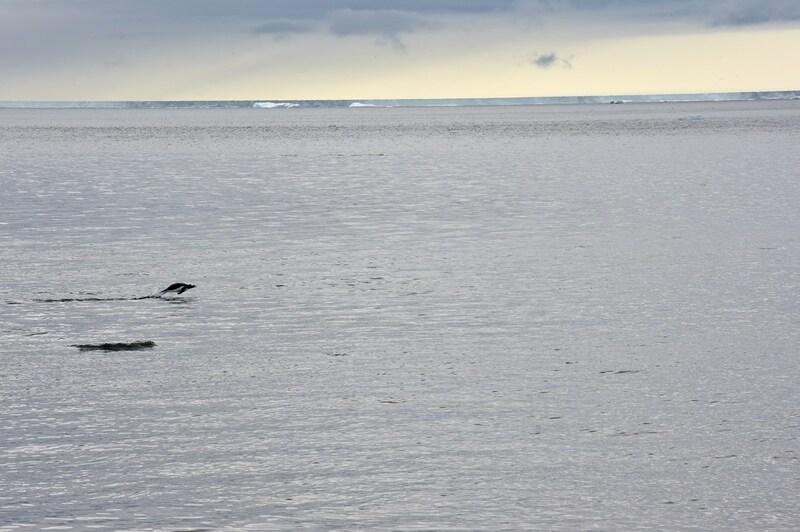 Its quite scary as no one wants to be food for the seals while searching for food. 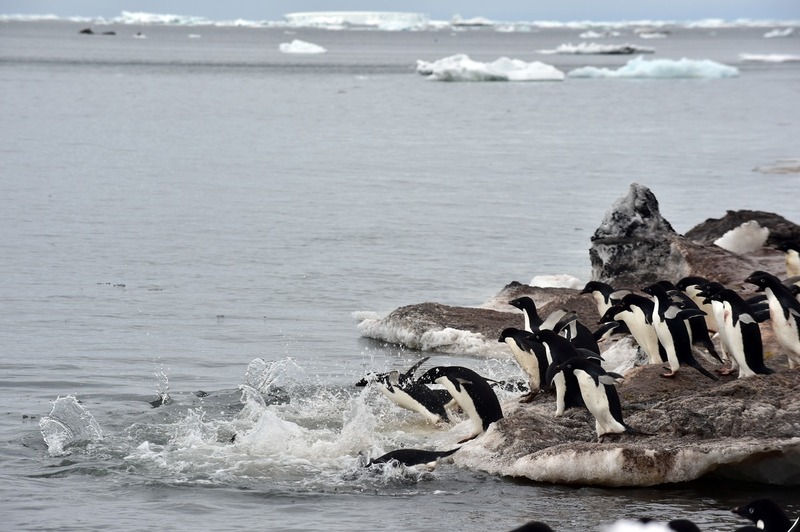 Penguins porposiging - This type of swimming is less energy efficient than staying completely submerged, but it has the benefit of allowing the birds to breathe more regularly and therefore swim much longer distances at greater speeds. 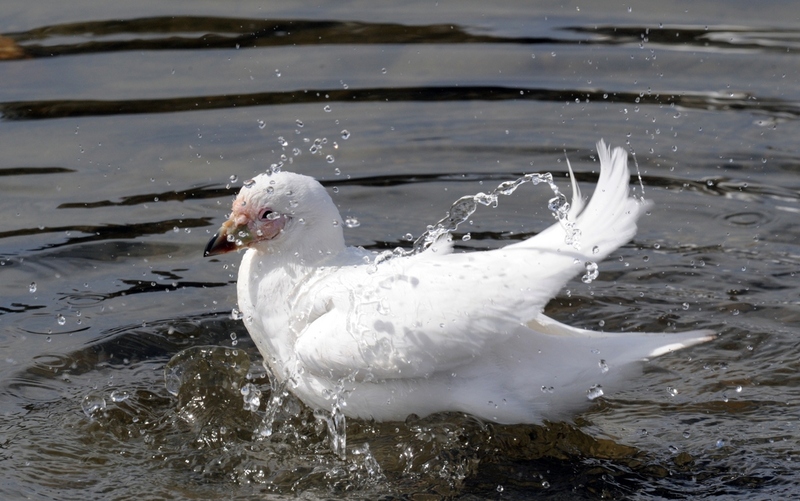 It is also believed that deliberate porpoising may be used to confuse and disorient both predators and prey, and some observations have shown that birds may make these leaps simply out of joy or excitement. The length of a porpoising leap can vary from 2-6 feet (.6-1.8 meters) depending on the water conditions, bird size and swimming speed. 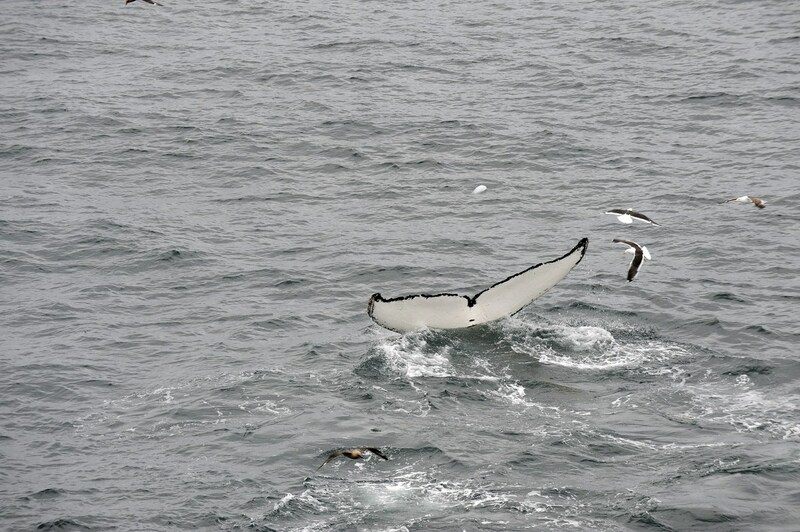 Once they catch the krill, they resurface back to shore ejecting out of the water vertically. And land on the belly making sure they dont crash on the rocks head on. 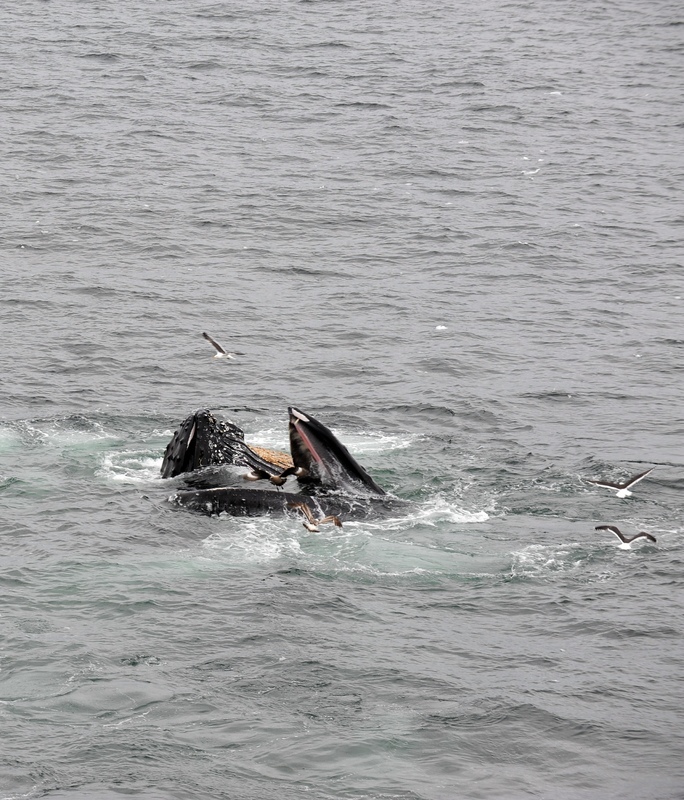 They dont fully eat and digest krill. 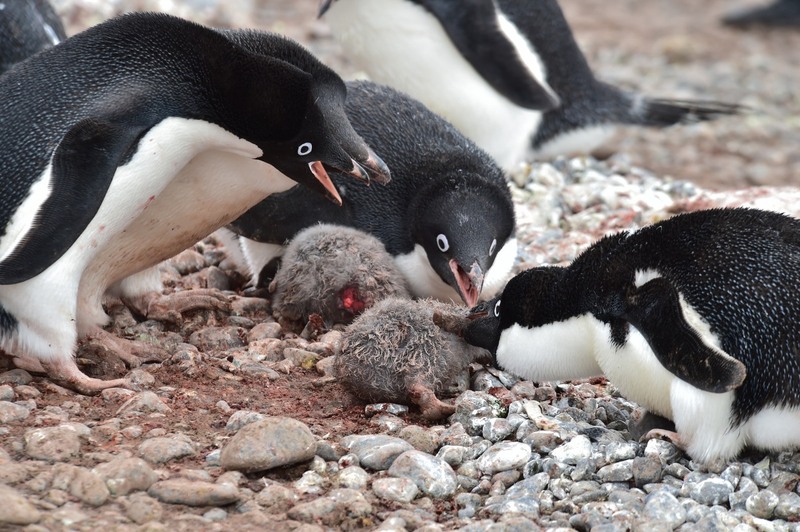 They are temporarily store din the digestive tracts only to be brought back up the throat when needed by the chicks. Regurgitation feeding. 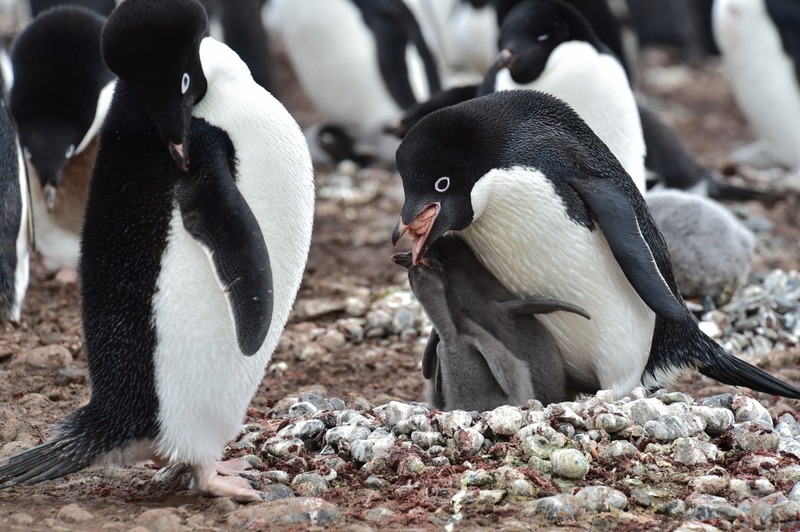 The young ones then literally feed on the krill by plunging their beaks into the mouths of the feeding parent. This type of feeding results in the stink and colour of landscape where half eaten food is plenty. Call it natural design or intentional - there is usually only one chick that grows well, that is often nurtured and well taken care of more than the younger sibling. When the elder chick grows good sign of growth and function, the younger ones are neglected. 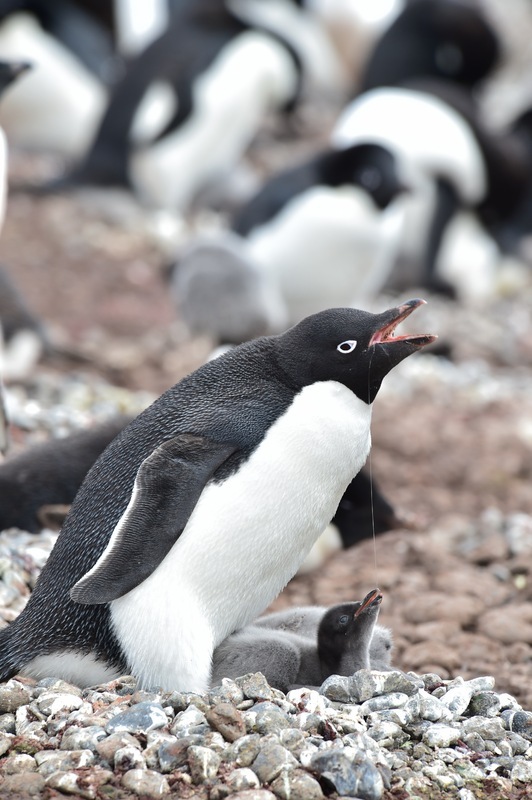 And end up being harassed and even hunted by other bully penguins. 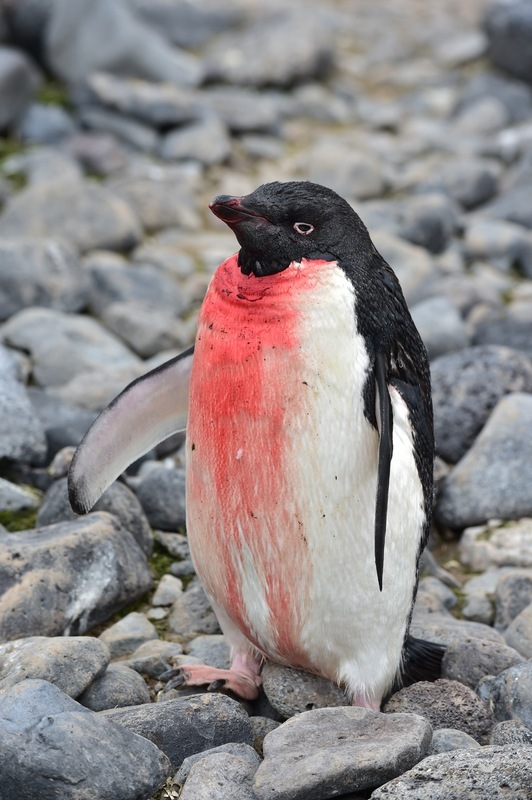 Not all penguins are cute. Some are bloody rascals who are not afraid to have a fight to get what they want. 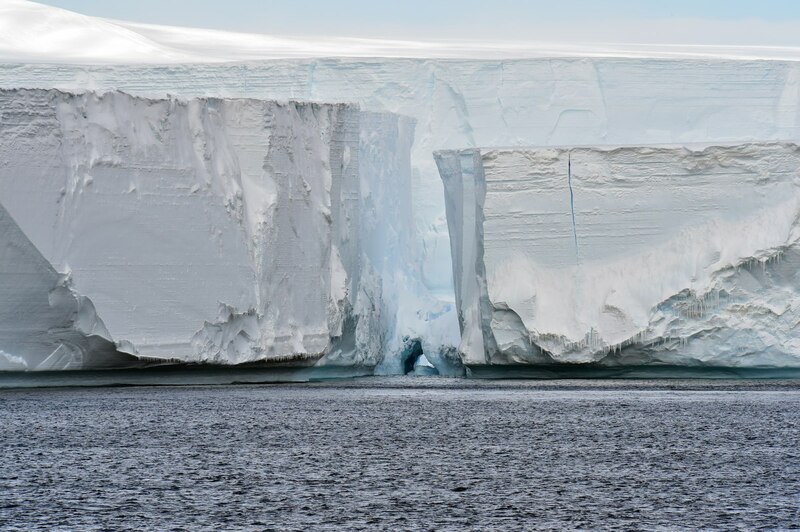 Tabular ice bergs are fractured segment of continental glacial ice. 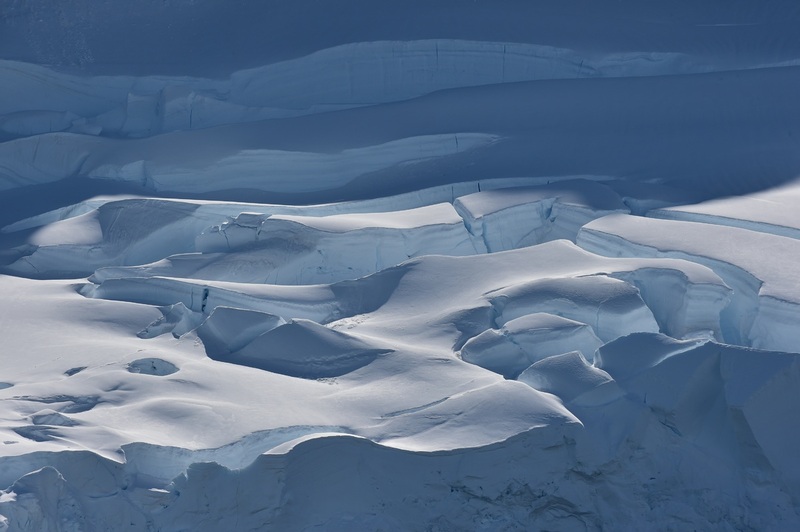 Shown above is part of the B15Y glacier. 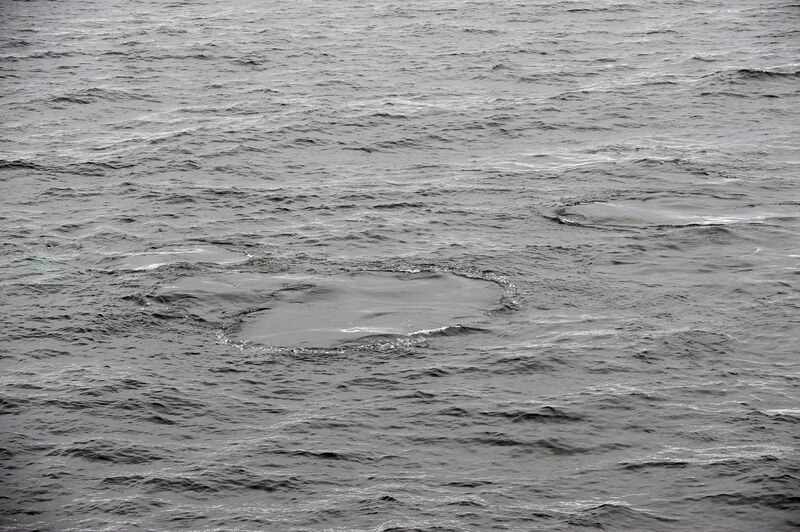 Above the water, they are sections with gaps in between. But below, they are all connected to a single base that is 17km long. 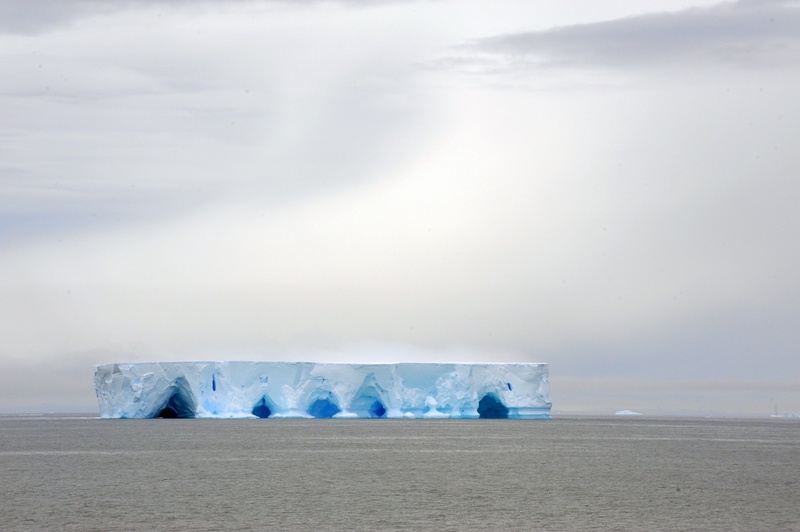 In March 2000, an iceberg calved off the Ross Ice Shelf in Antarctica. Named B-15, it measured roughly 275 by 40 kilometers (170 by 25 miles). 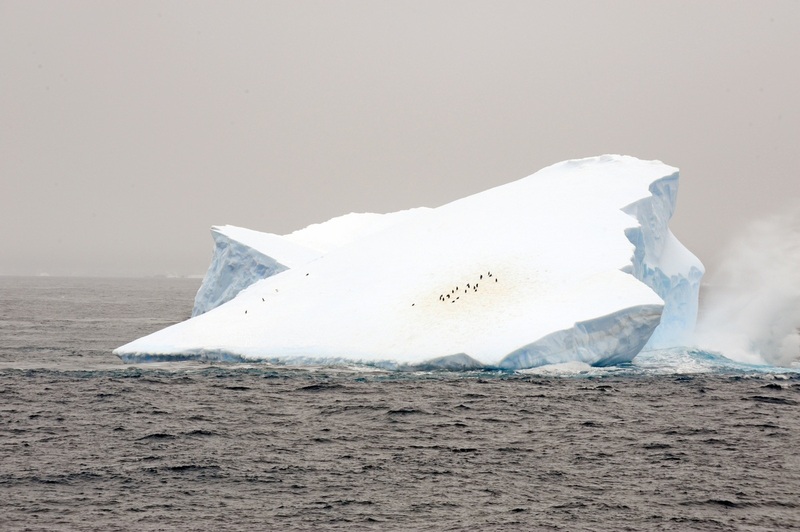 The iceberg subsequently broke into pieces, one of which is the B15-Y. 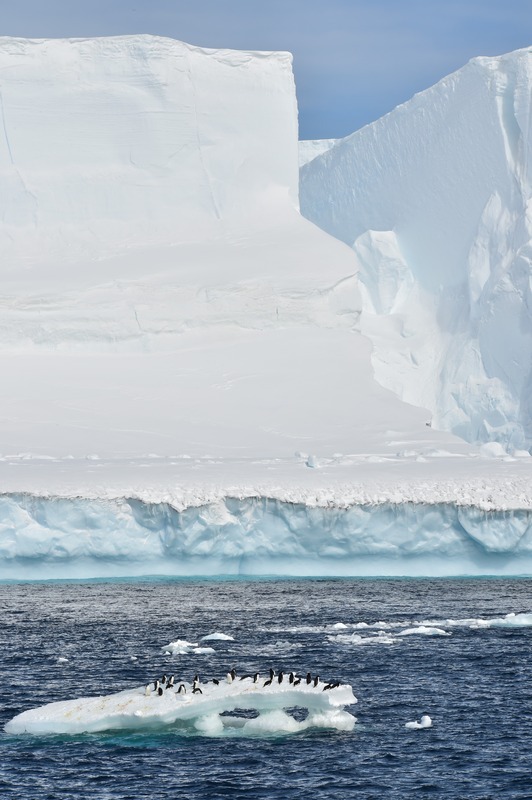 Standing tall - but still part of the same tabular berg underwater. Ice and icicles on B15 Y. Formations at the top of the tabular berg. Bubbles at the surface of the water. 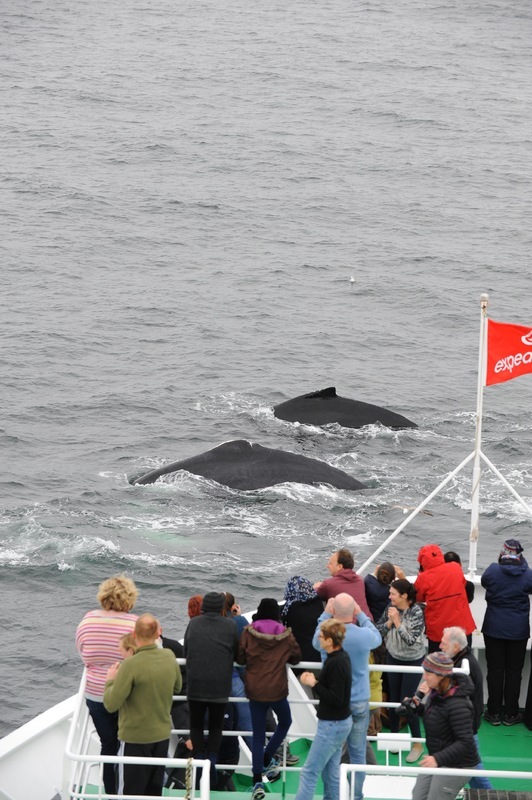 This is the sign of the most amazing hunting phenomenon by humpback whales in the water. They blow bubbles from the under the water surrounding large shoals of fish or krill. 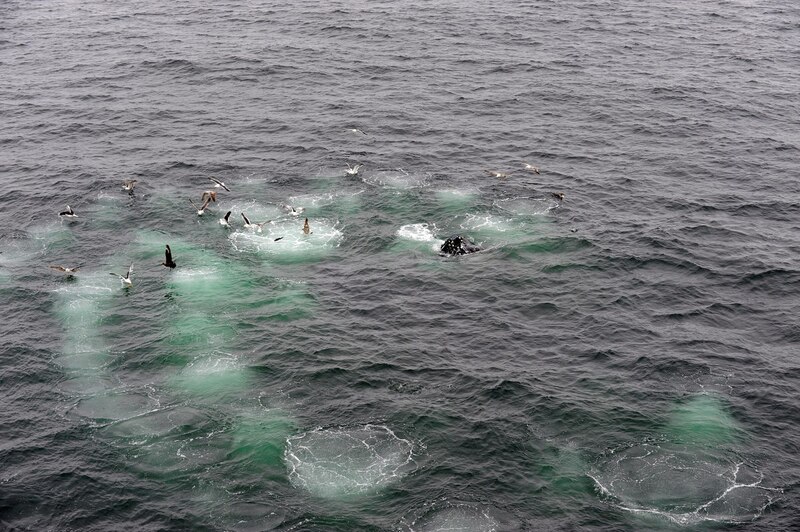 The prey get perplexed in the midst of bubbles and are easy catch to the whales. 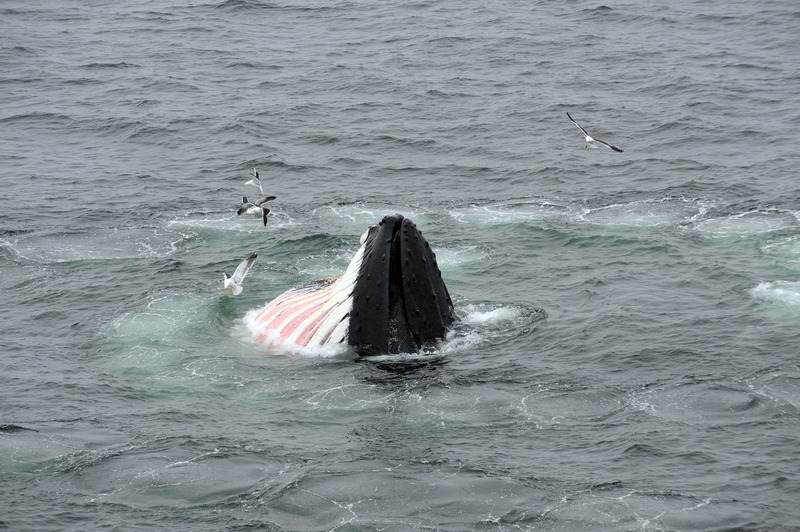 They are categorised as baleen whales - referring to the baleen or hairy mesh like growth on either side of the pink muscle in the upper jaw on the right whale above. This is distinctly different to to toothed whales such as orcas. 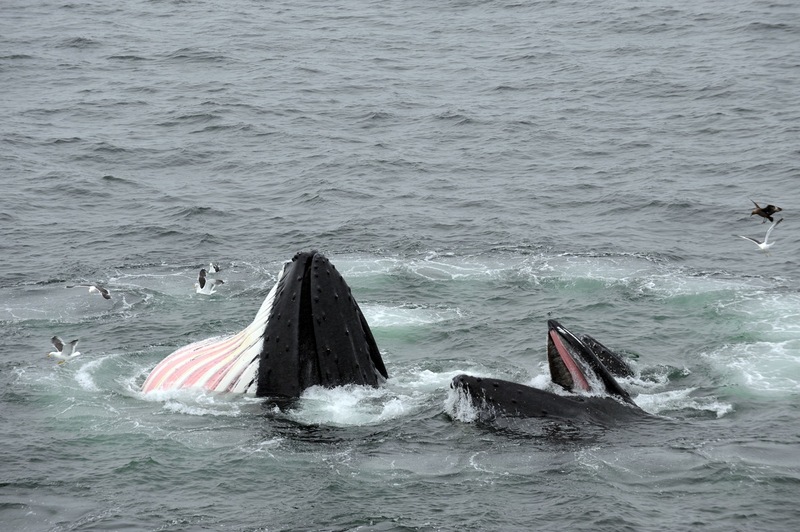 Juvenile humpback whales display tenderpink throats - with blood flowing in the reliefs of the lower throat. 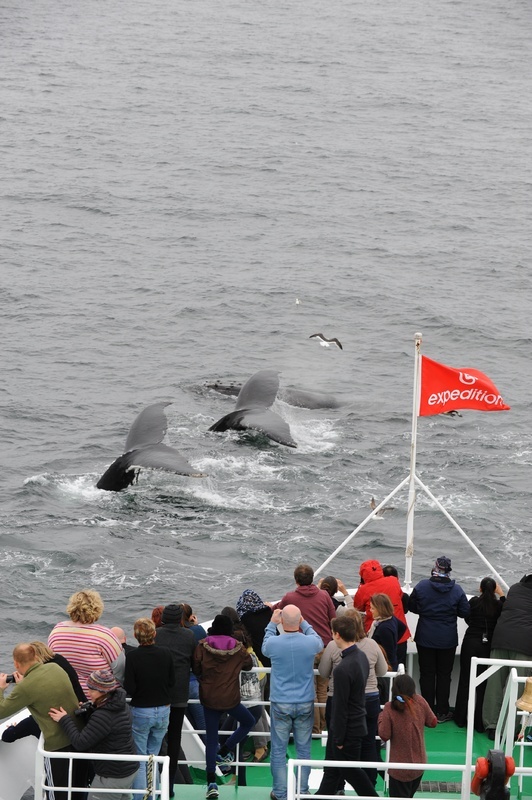 The whales then surface and target the next shoal of fishes to bubble net and feed on. 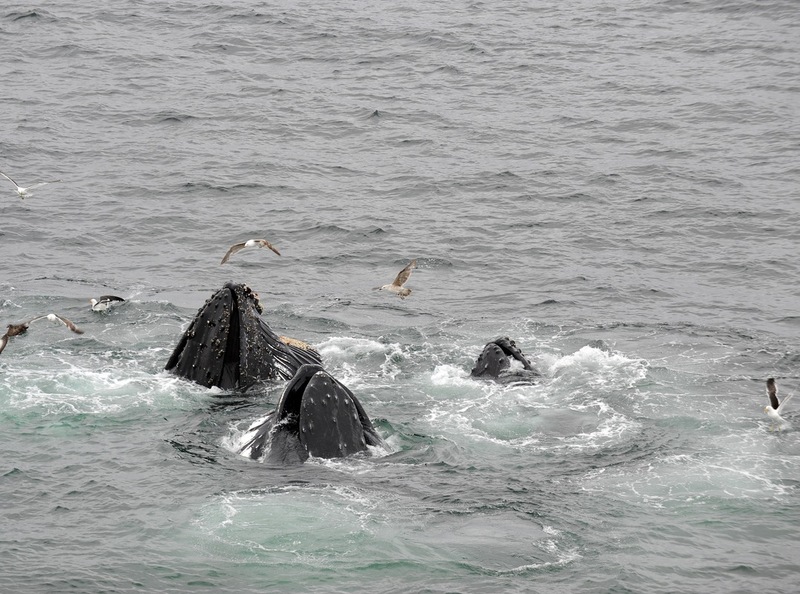 Found in oceans and seas around the world, humpback whales typically migrate up to 25,000 km (16,000 mi) each year. 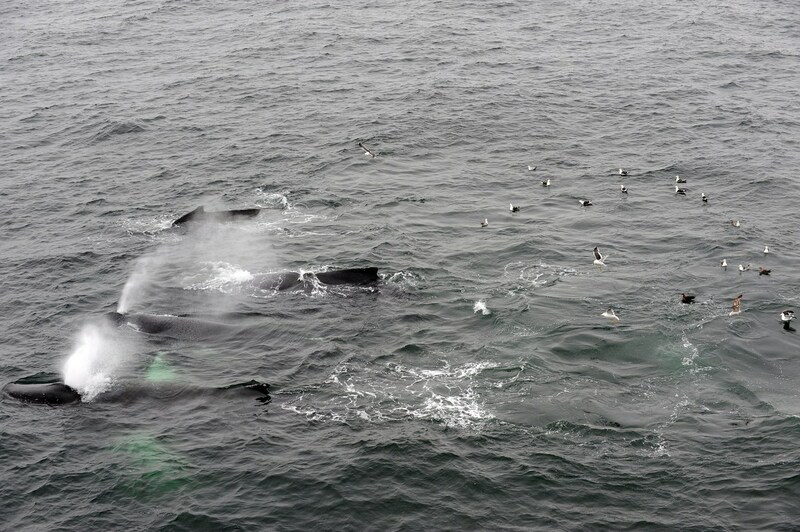 Humpbacks feed only in summer, in polar waters, and migrate to tropical or subtropical waters to breed and give birth in the winter when they fast and live off their fat reserves. 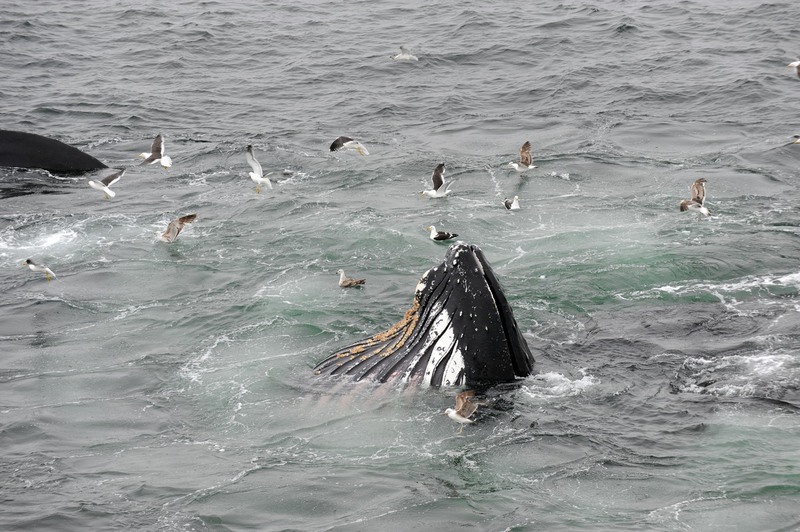 Like other large whales, the humpback was a target for the whaling industry. Once hunted to the brink of extinction, its population fell by an estimated 90% before a 1966 moratorium. While stocks have partially recovered, entanglement in fishing gear, collisions with ships, and noise pollution continue to impact the population of 80,000. When they dive into water, the tail leaves behind "oil spill" like water surface. 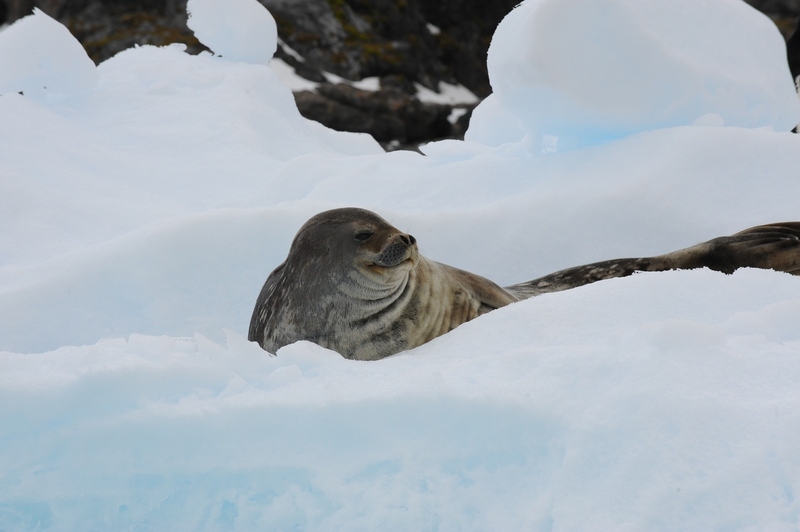 Antarctica is also home to seals - several types - Weddell seal shown above - named after British navigator James Weddell. 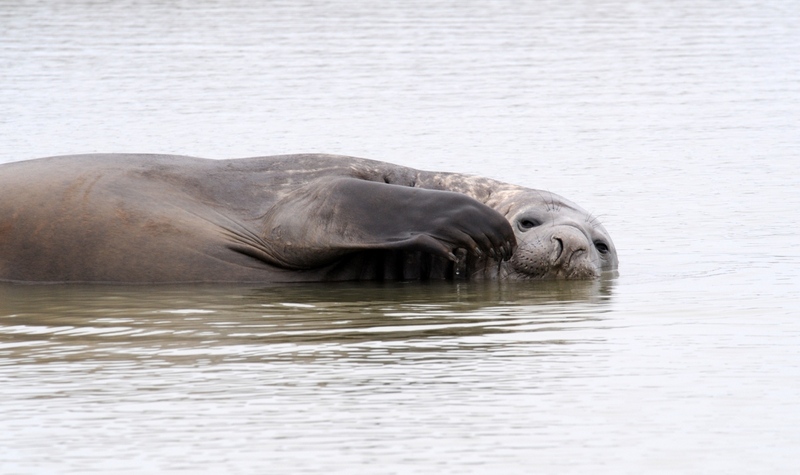 A juvenile elephant seal relaxes on Elephant Point. 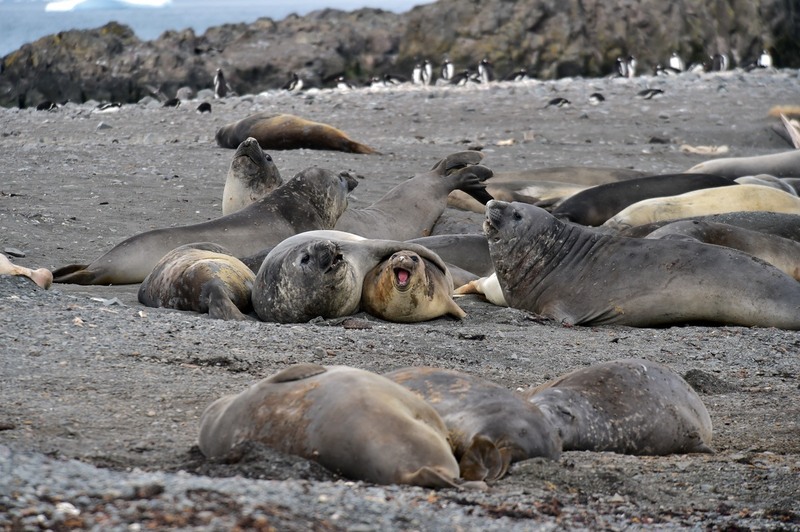 Elephant seal colony - Elephant seals take their name from the large proboscis of the adult male (bull), which resembles an elephant's trunk. The bull's proboscis is used in producing extraordinarily loud roaring noises, especially during the mating season. More importantly, however, the nose acts as a sort of rebreather, filled with cavities designed to reabsorb moisture from the animals' exhalations. 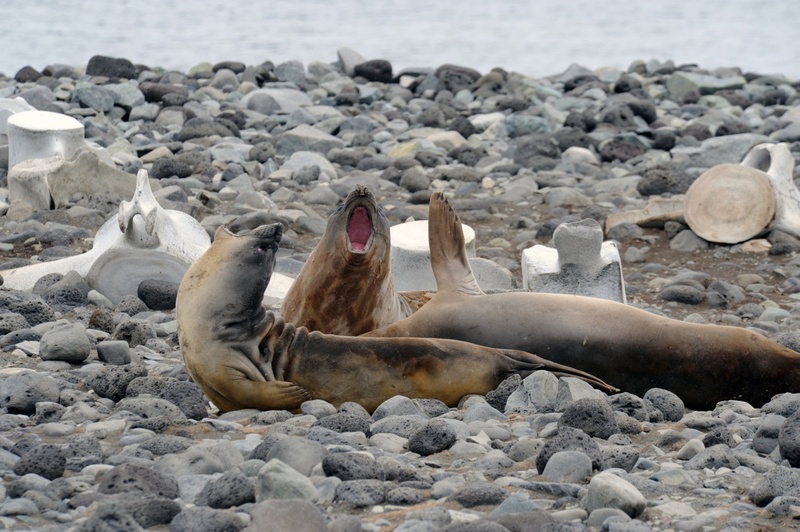 Elephant seals have a very large volume of blood, allowing them to hold a large amount of oxygen for use when diving. 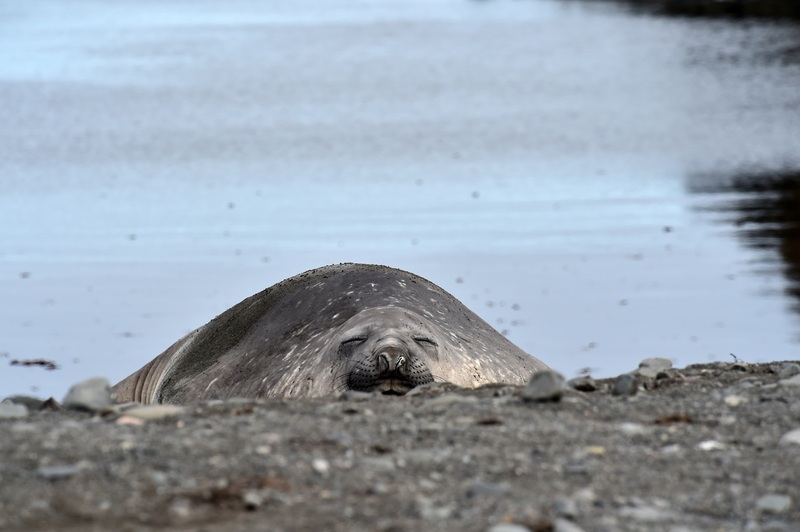 Elephant seals are shielded from extreme cold by their blubber, more so than by fur. The animals' hair and outer layers of skin molt in large patches. 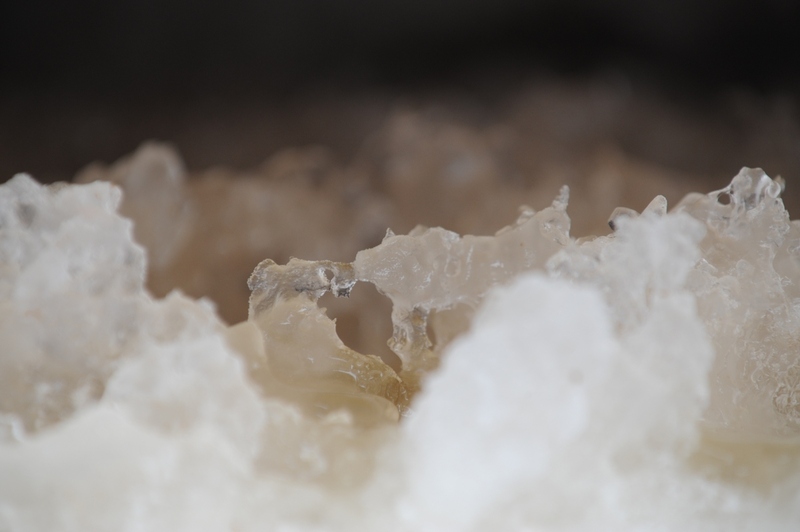 The skin has to be regrown by blood vessels reaching through the blubber. 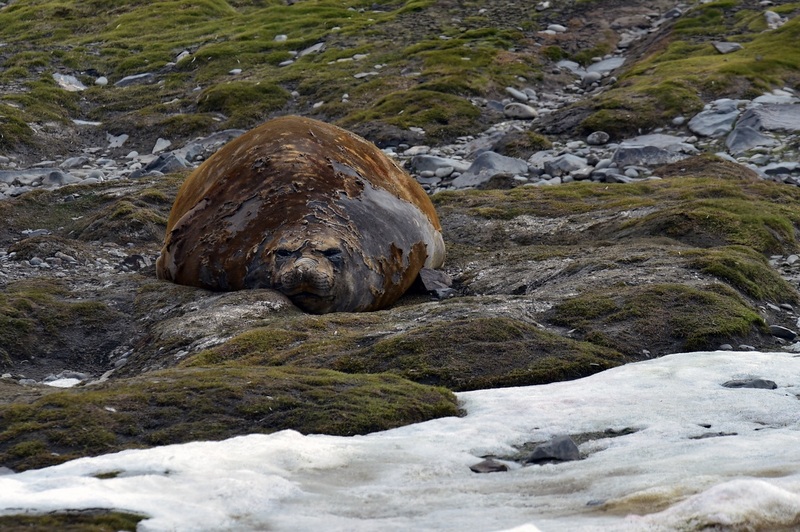 When molting occurs, the seal is susceptible to the cold, and must rest on land, in a safe place called a "haul out". 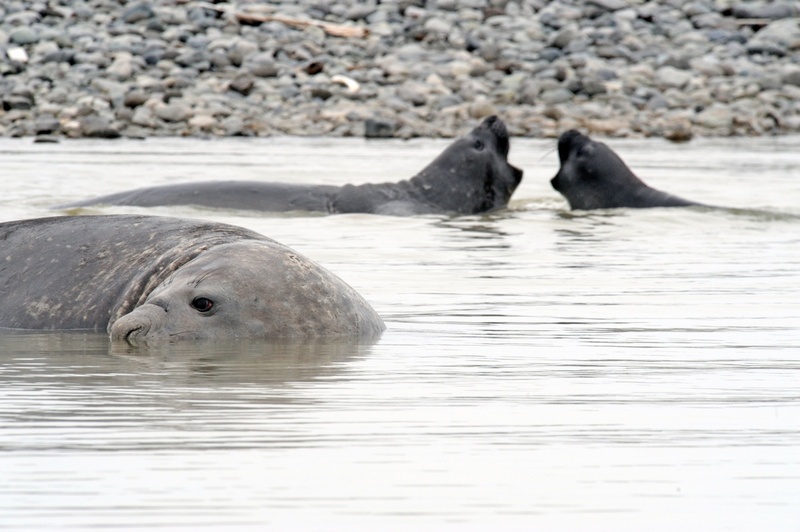 Northern female elephant seals have lived for 22 years, and can give birth starting at the age of three to four. Males reach maturity at five to six years, but generally do not achieve alpha status until the age of eight, with the prime breeding years being between ages 9 and 12. The longest life expectancy of a male northern elephant seal is approximately 14 years. 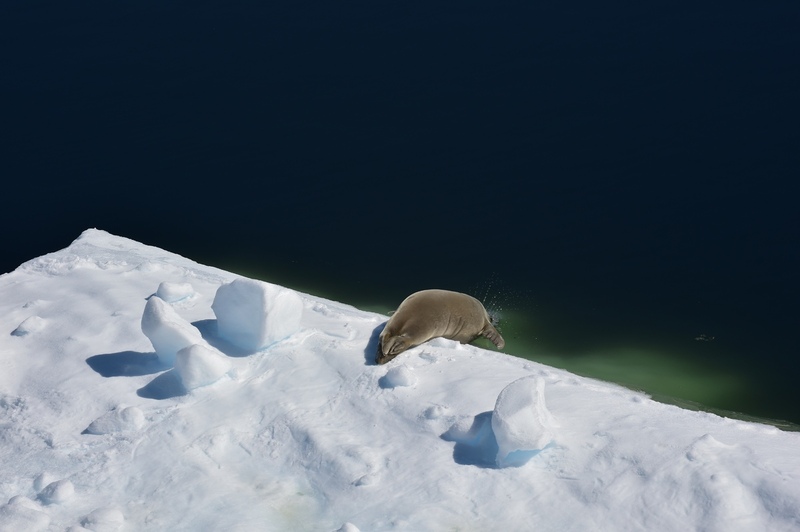 Weddell seals gather in small groups around cracks and holes in the ice. 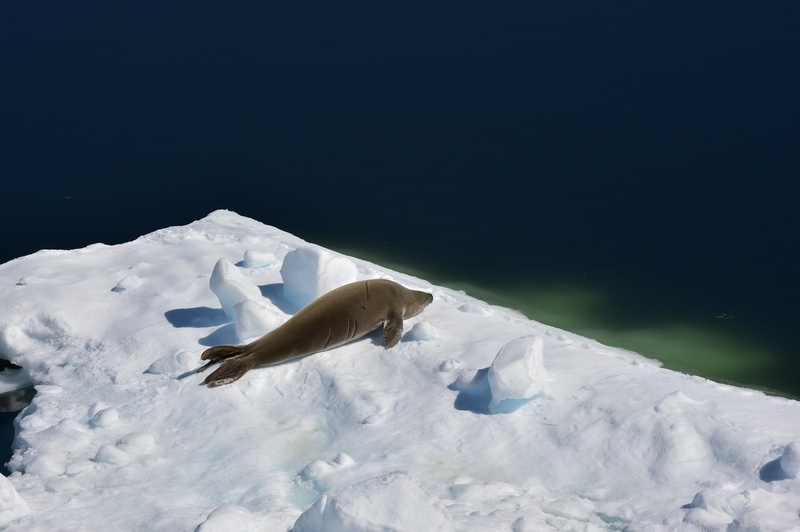 Scientists believe Weddell seals rely mainly on eyesight to hunt for food when light is available. 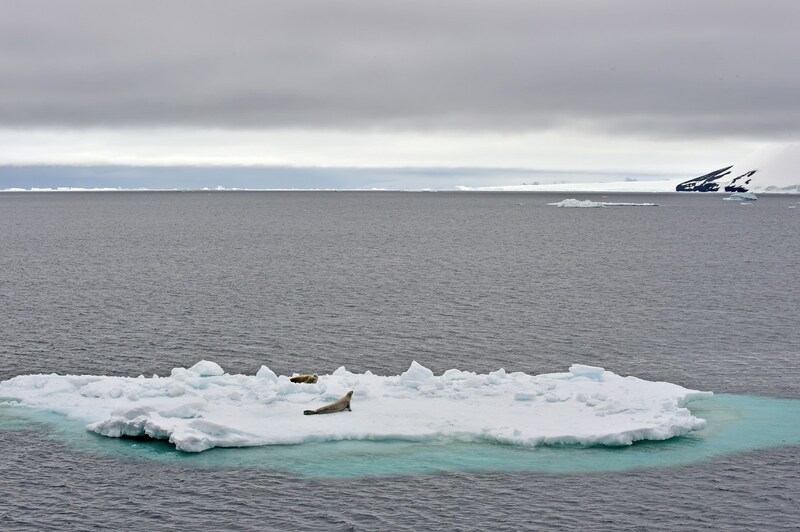 However, during the Antarctic winter darkness, when no light is available under the ice where the seals forage, they rely on other senses, primarily the sense of touch from their vibrissae or whiskers, which are not just hairs, but very complicated sense organs with more than 500 nerve endings that attach to the animals snout. The hairs allow the seals to detect the wake of swimming fish and use that to capture prey. 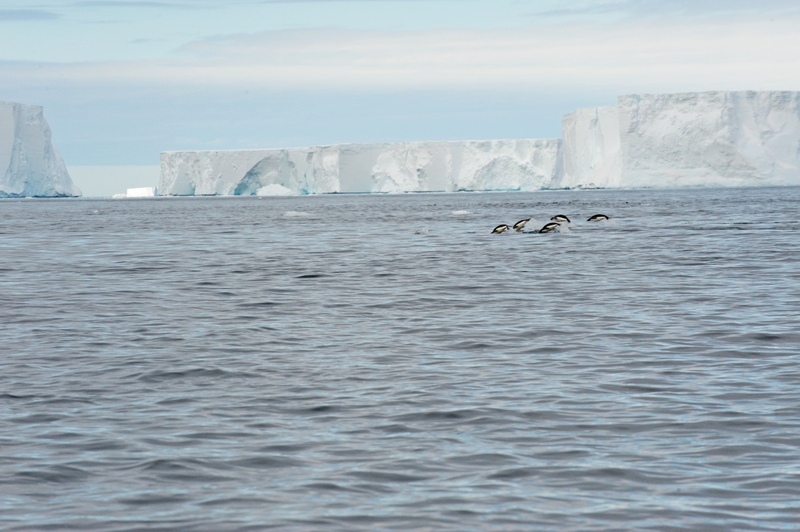 These animals can also be found in large groups on ice attached to the continent. 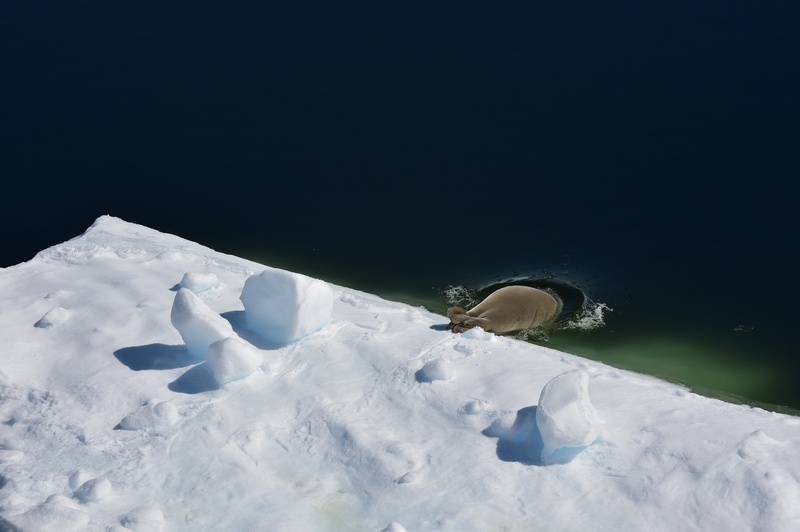 In the winter, they stay in the water to avoid blizzards, with only their heads poking through breathing holes in the ice. 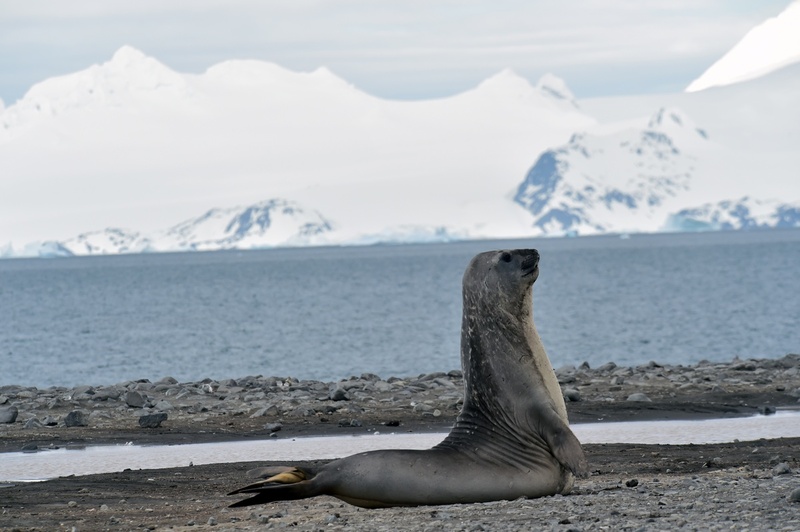 The leopard seal also referred to as the sea leopard, is the second largest species of seal in the Antarctic (after the southern elephant seal). The uncanny smile is not reflective of how friendly it is, but a distinctive feature to identify one. 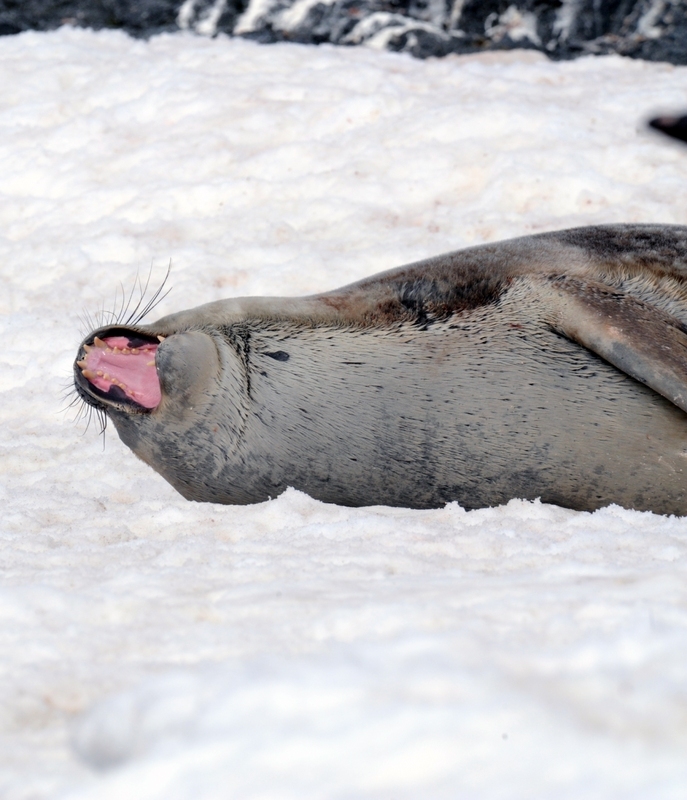 The crabeater seal is a true seal with a circumpolar distribution around the coast of Antarctica. 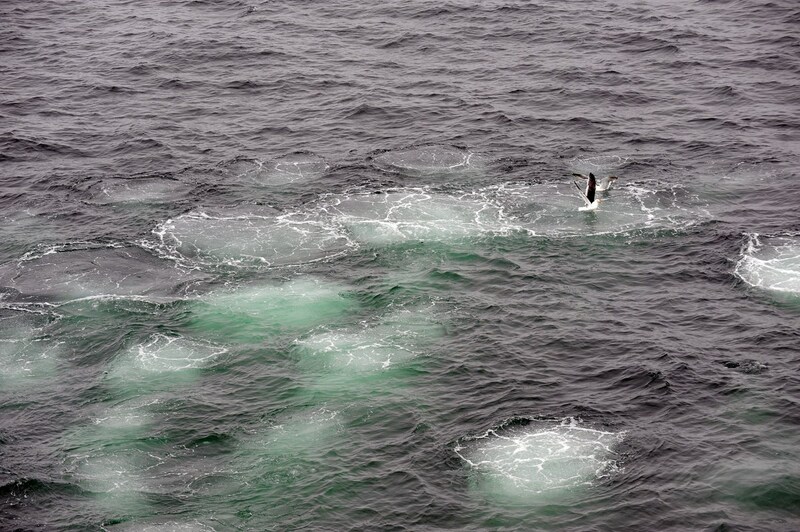 They are medium- to large-sized (over 2 m in length), relatively slender and pale-colored, found primarily on the free-floating pack ice that extends seasonally out from the Antarctic coast, which they use as a platform for resting, mating, social aggregation and accessing their prey. 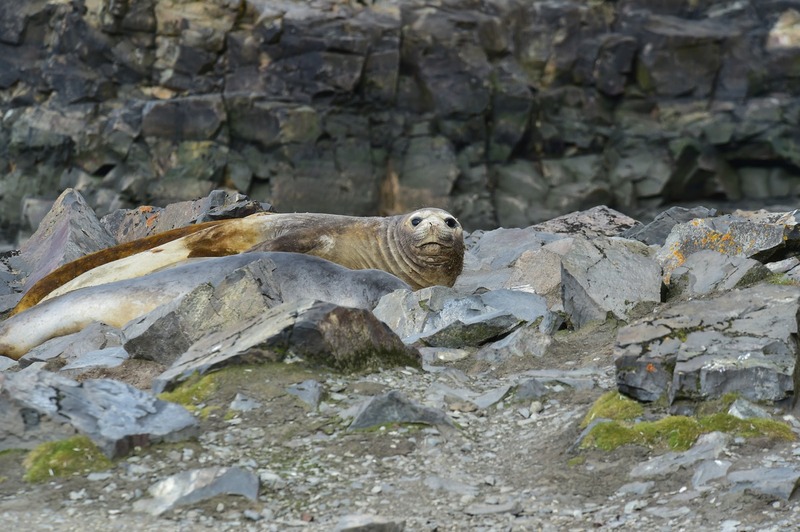 They are by far the most abundant seal species in the world. While population estimates are uncertain, there are at least 7 million and possibly as many as 75 million individuals. 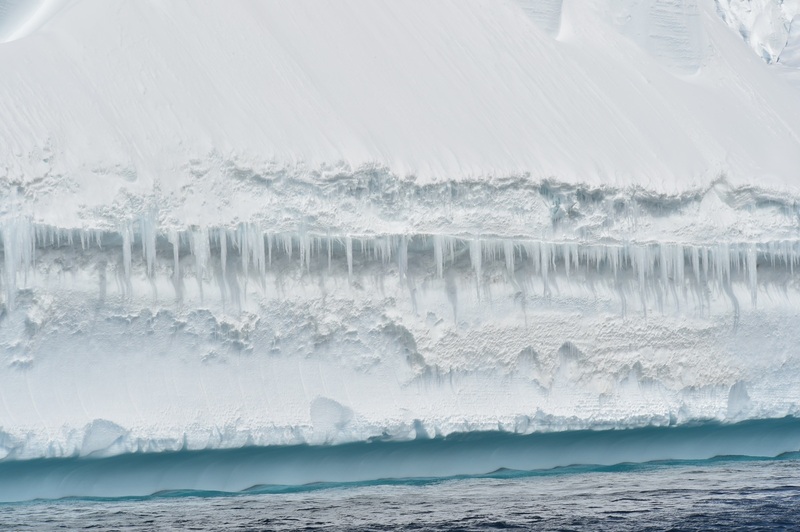 This success of this species is due to its specialized predation on the abundant Antarctic krill of the Southern Ocean, for which it has uniquely adapted, sieve-like tooth structure. 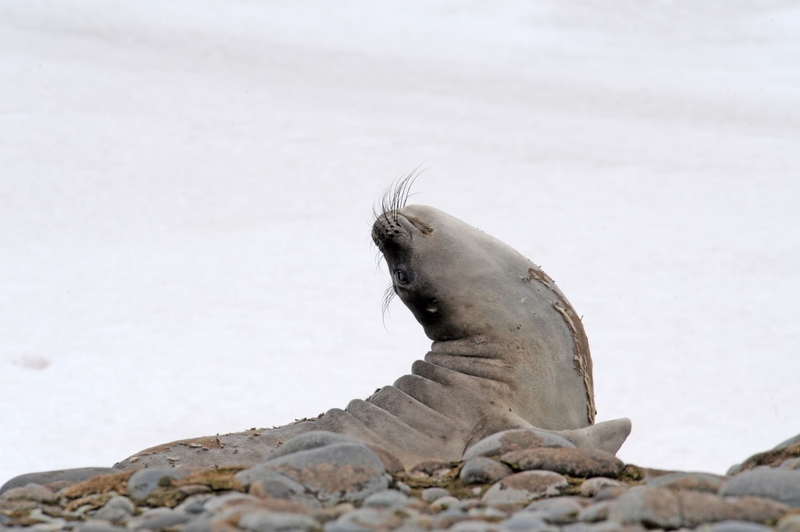 Despite its name, crabeater seals do not eat crabs. 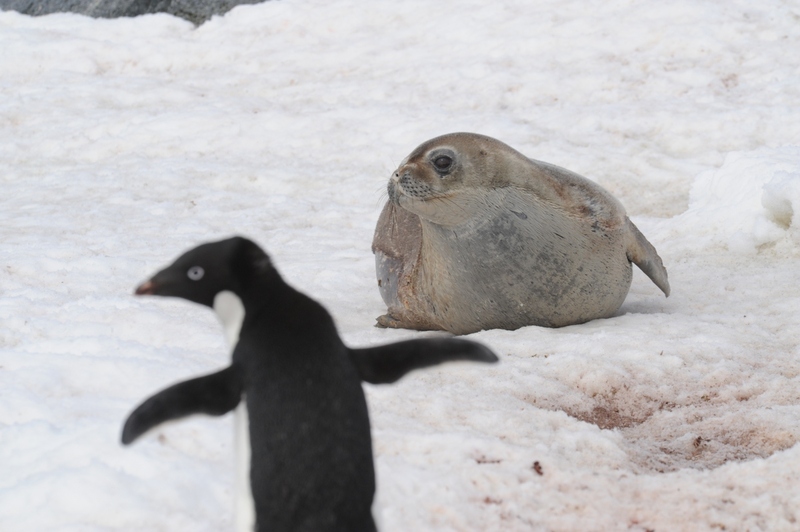 As well as being an important krill predator, the crabeater seal is an important component of the diet of leopard seals which consume about 80% of all crabeater pups. 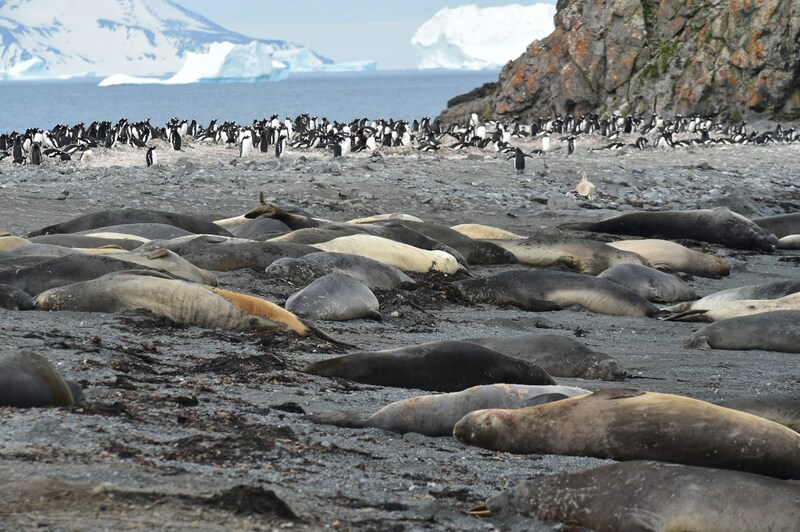 The most gregarious of the Antarctic seals, crabeaters have been observed on the ice in aggregations of up to 1,000 hauled out animals and in swimming groups of several hundred individuals, breathing and diving almost synchronously. 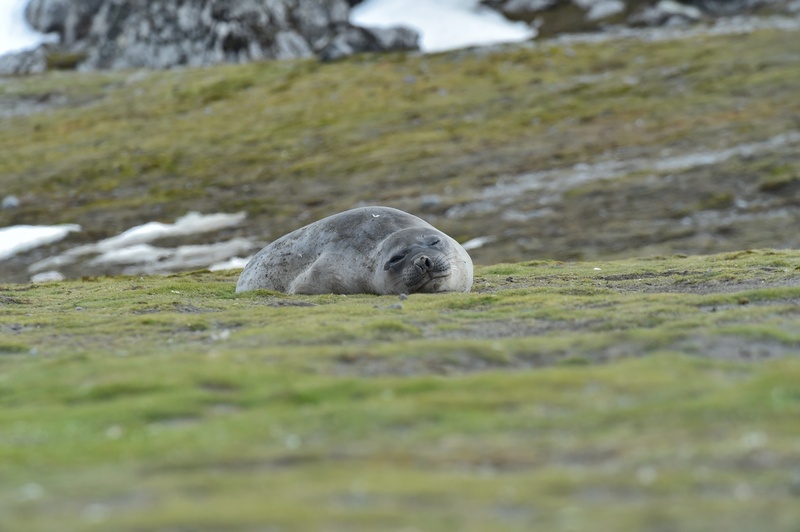 An international effort, the Antarctic Pack Ice Seal initiative, is currently underway to evaluate systematically collected survey data and obtain reliable estimates of all Antarctic seal abundances. 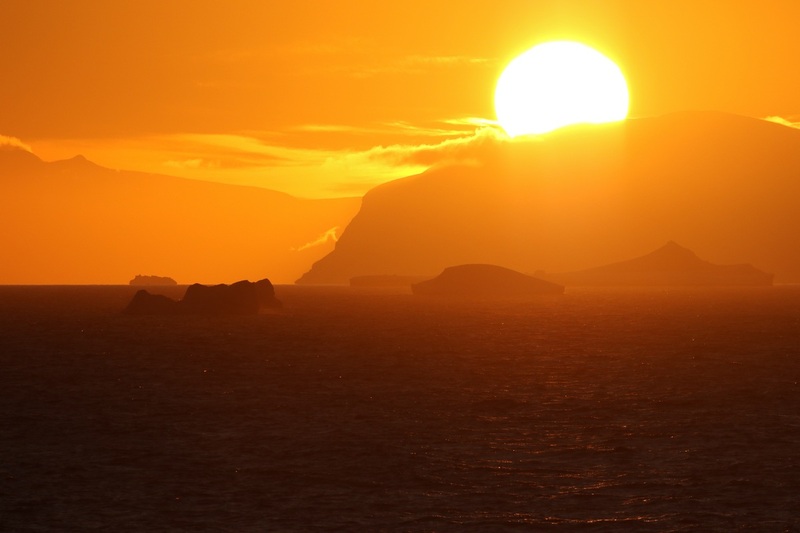 As the sun begins to set, Antractica opens up another show of enchanting landscapes. Sun kissed mountains at dusk. 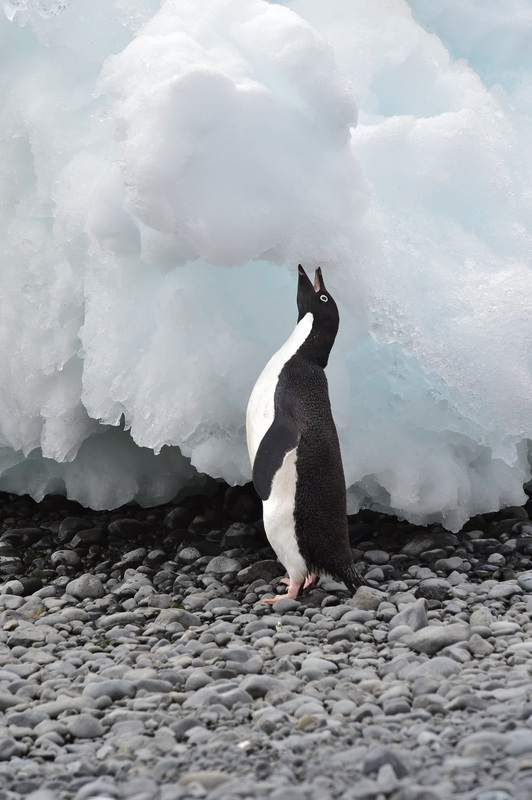 Penguins privy to their isolation. 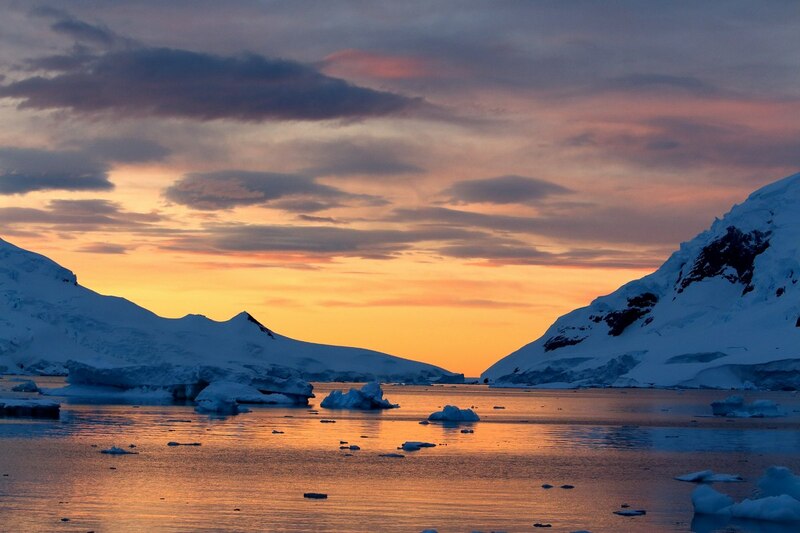 Floating icebergs dot the dusky waters. 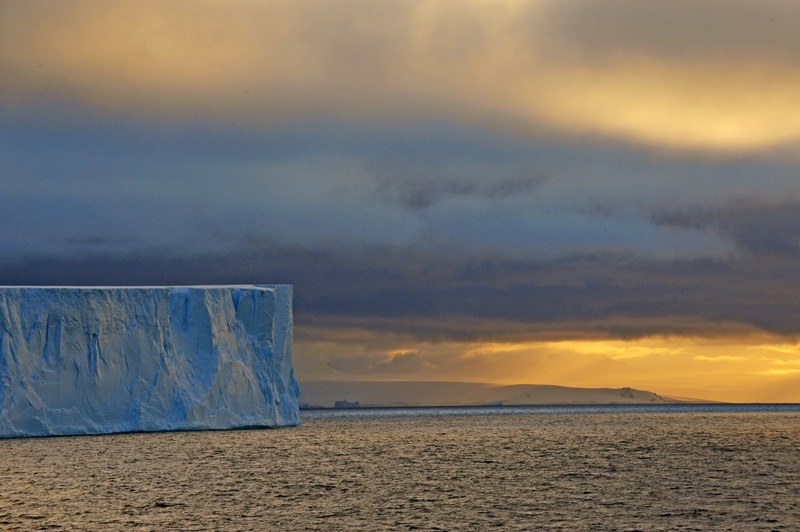 Elsewhere tabular bergs stand majestically tall as the last minutes of daylight shimmer in the horizon. 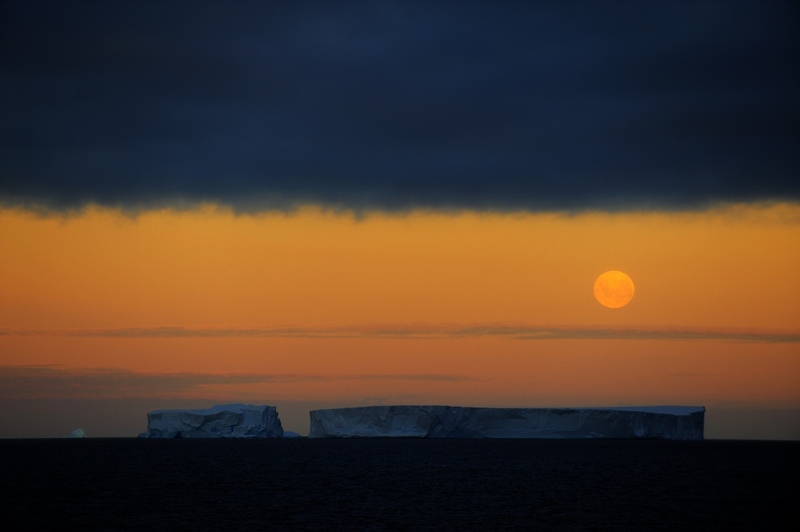 A full moon above tabular bergs on Christmas Day - a once in 75 year phenomenon. Take the rockies, the alps, and Mount Washington, cover them with thick, crusted snow that, like frosting spread by a giants hand, has spilled down over the land, to end in a jagged, uneven boarder where it meets the sea. 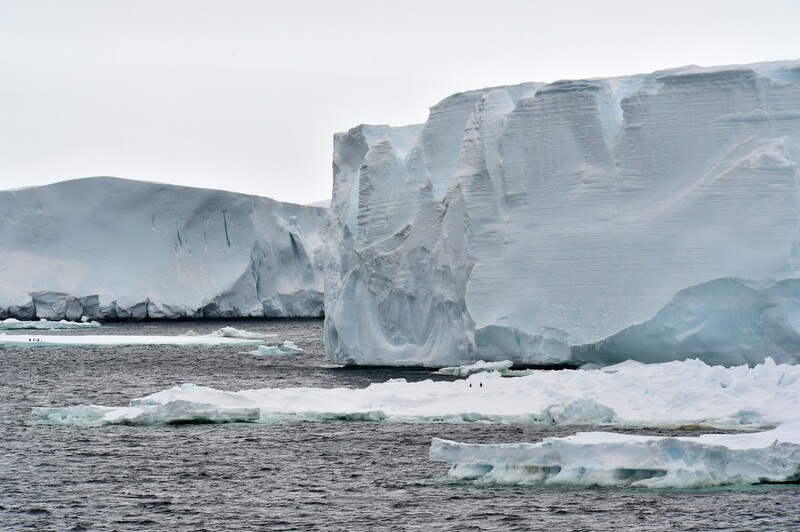 Imagine yourself on a spaceship in another world - a world that for 10 million years has been locked away behind ramparts of ice and where escape is blocked in all directions by a cruel, cold ocean. From "My Antarctica Honeymoon," by Jenny Darlington, one of the first two women to over winter in Antarctica 1947-48.